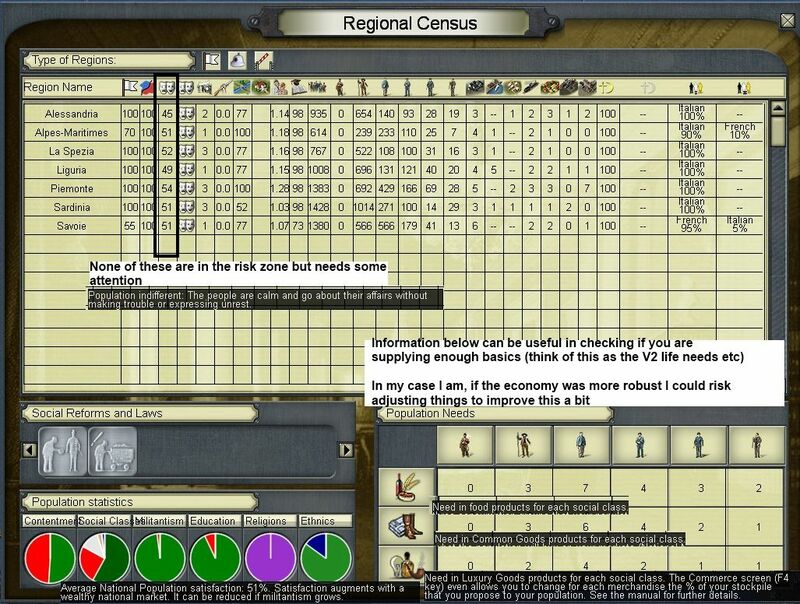 This AAR started on the Paradox AGEOD AAR forum and I'm migrating it over here. All the posts up to mid-1879 have already been shown before but I wanted to make it complete (I'll clearly indicate when new material starts here). As the comments were such an important part of the AAR, what I've done is to also copy over most (not all) of my responses to comments in the original. Some of that discussion corrects my misundestandings and offers a deeper insight into the game or my strategic logic. I'll put in the old posts relatively quickly (not least I want to save it all and finish off the reports of my first war with Austria ... foreshadowing ...). But if there are any new comments or questions, I'll answer them as I go along (& would be delighted to see them). 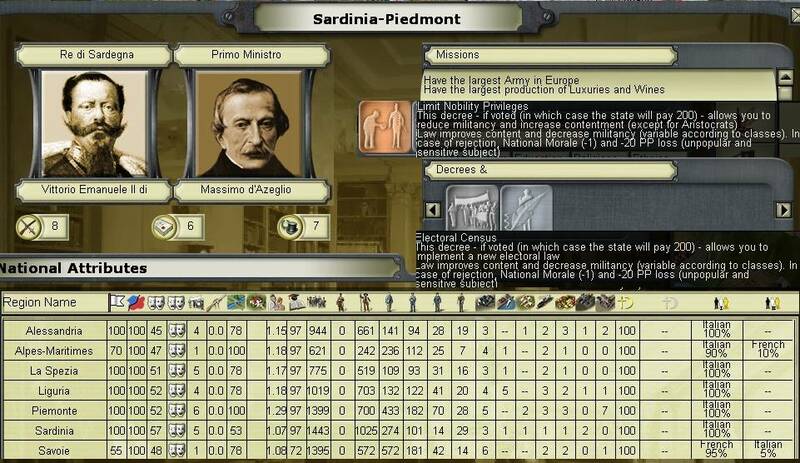 My original goal was not a GC as such but instead to use Sardinia-Piedmont to explore the games economic engine (& to a lesser extent diplomacy and colonialism). As such it is hopefully a useful 'how to' resource but there are errors. I'll correct the worst as I copy files but in effect this was a 'teach yourself PoN' exercise. Where I have changed or added to the original (to correct the worst errors), I've used [color="#FF0000"]red text[/color]. By 1865 I ended up with a united Italy south of the Po (the alternate event chain) and the world that was emerging was becoming rather fascinating. So all things being equal I now intend to take this to 1920 - not least there are no other reports of the late game PoN-verse available (or at least that I have seen). I should say, this is a vanilla game but with quite a lot of scripts and events imposed. Some of these correct for in-game event chains that are broken and some are to make my emerging Europe make sense. I love the way that PoN enforces a 19C mindset (so no world conquests here) of limited wars and small gains, but I did want some degree of dynamism as well. 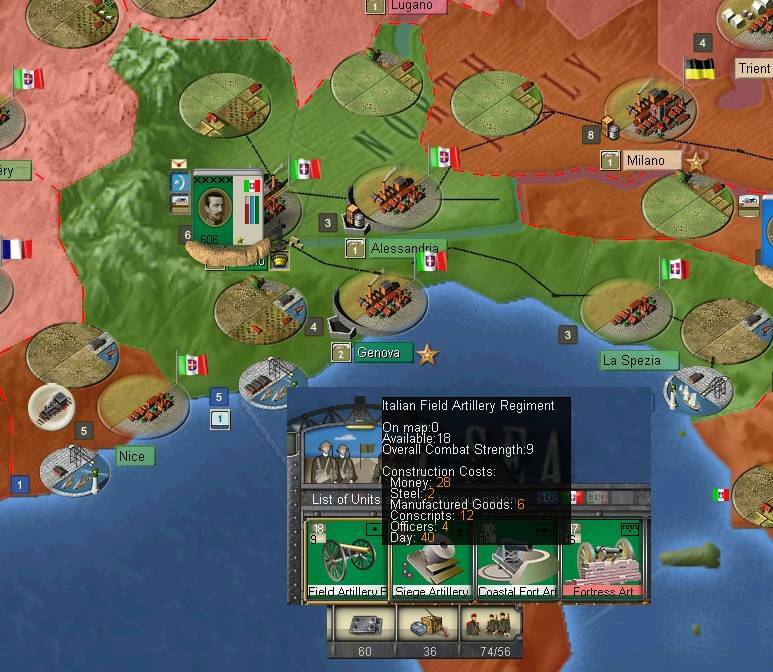 I'll indicate this where it happens but some egs are to give Italy the full range (& full volume) of colonial cards (since my Italy is going to become the dominant power in the Red Sea and E Africa). Some of the older screenshots don't work any more, I find that image shack has the bad habit of sometimes eating them (there maybe a more technical explanation), depending I'll try and find back the originals if it seems to be really important. Quick note on settings. 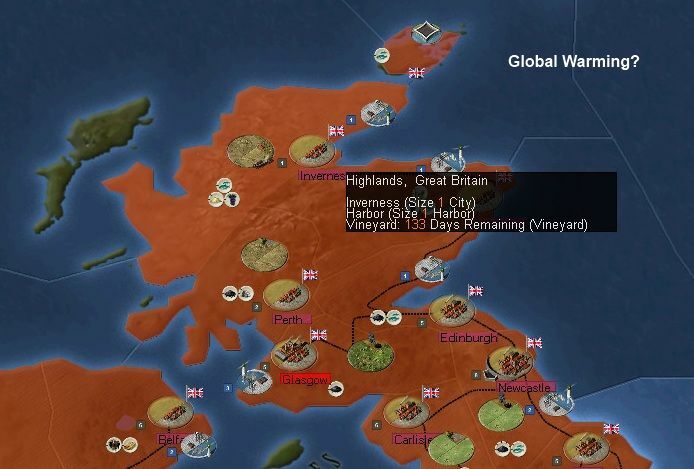 Its on medium difficulty (up to 1875 when I shifted to hard), historical attrition for the player, and the restricted SOI constraint. For obvious reasons, despite my usual preference in AGE games, I haven't allocated the AI 'more time'. At the start I was getting turn processing of around 2-3 minutes. By the 1870s of 4-5 minutes. 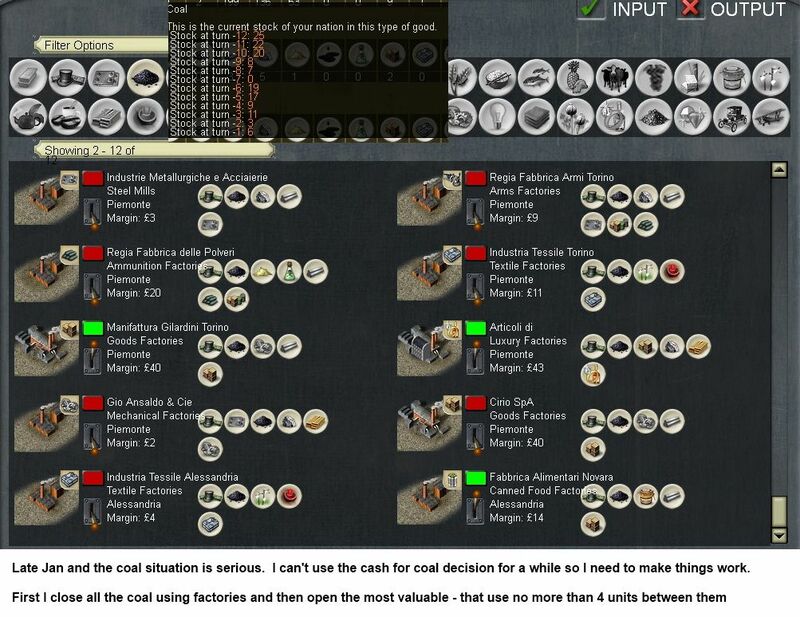 As is discussed in a few places, I turned this to my advantage so a lot of turns were played when I was cooking (some recipes are included), doing housework or working on a different computer. Since you don't need to watch the screen (unless you are at war - and even then only during this actual turn processing), this has got me through around 30 years in about 9 months (+ the usual gaps of no game play at all). 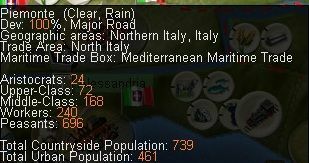 Ok, so lets have a look at the country, I have 6 provinces (one reason for choosing S-P than one of the more interesting countries), 5 on the mainland and the island of Sardinia. 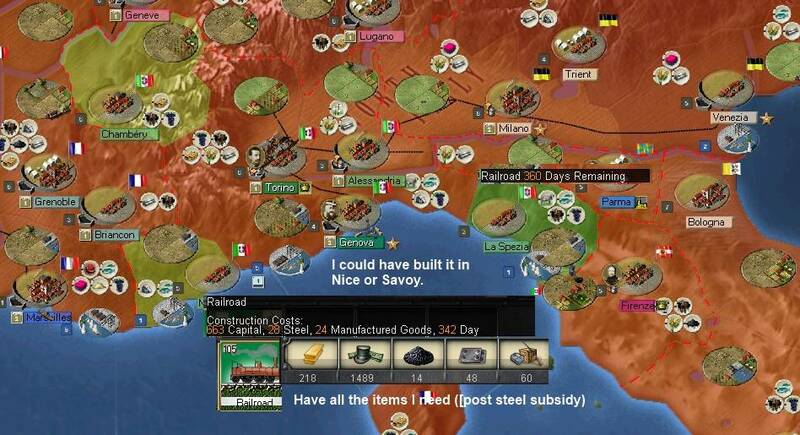 Here's Italy, soon (well in around 480 turns) it will all be mine. Now don't panic, that is actually quite clear so we'll start with a look at Piedmont, later to be home of FIAT and many dodgy referee decisions. Now the other screen you get by pressing B and this allows you to intervene (note you can have both open at the same time). 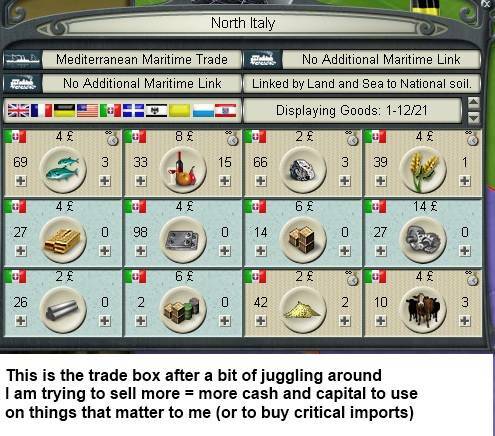 If I wanted coal from somewhere else than those options I may need to build more merchant ships so as to open up the trade routes. Something to worry about later. So, thats little more than a wander around the main economic information. 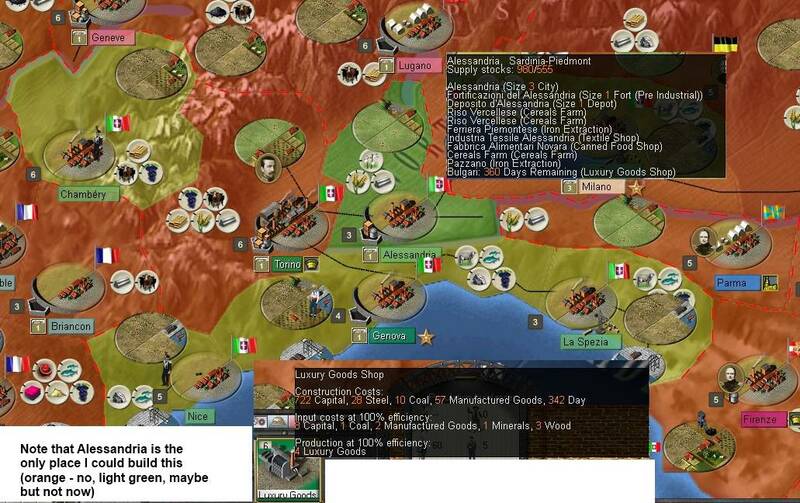 Next post will look at a few other screens and then we'll run a few turns and come back to review the economy. So before, pressing the go button, lets have a look at a few other useful screens. I'll ignore the army options for now as they are more typical of other AGEOD games, I'll review them and the options in context. I'll come back to this later, but at the bottom is some particularly valuable information. 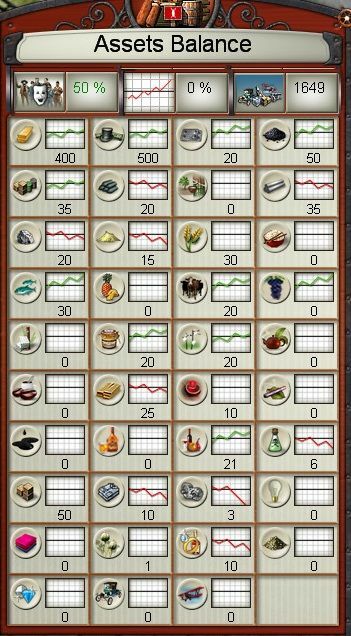 My population, on average is 50% content and in the right hand corner I have information on their needs in terms of the 3 types of goods in the game (you have a variety of ways to satisfy each of these, but the best is via a mixture). I'll come back to this in a few turns as it is a useful tool to advise on tweaking trading and production strategies. Now I'm not going to build anything yet, but you build 'structures' in PoN the same way you build units in most other AGEOD games. 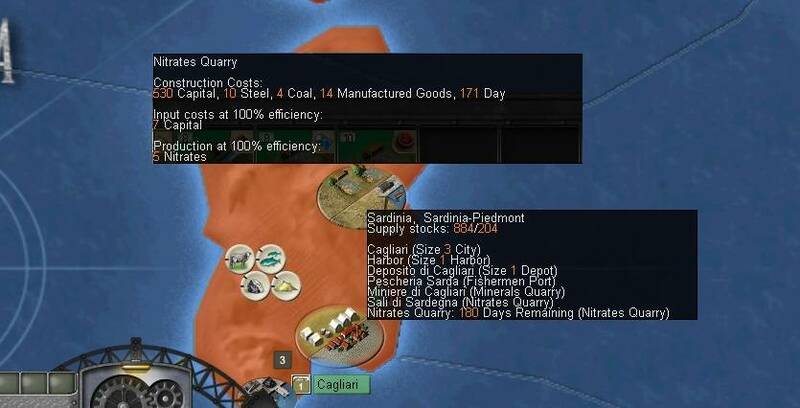 In this case, I could build a nitrates quarry in Sardinia but I lack the capital to do so. You also build colonial events and some decisions in much the same way. Anyway, fascinating as all this is, lets move on. In this case most of my initial messages discuss the details of my economic efforts. And here's another useful screen, well more use for a power with a long range but it gives a quick indication of where my assets are. I'd spotted I was doing some trades with Uruguay and Argentina. Well the blue blob off the coast is the reason – I have a presence in that particular maritime trade area so can sell and buy in the markets that are connected. And here is our trusty resource sheet. As you can see not only does it indicate likely changes in the next turn, you can also gain an overview of past changes. Note the useful advice on what I could build. I'll make use of that fairly soon (I'm assuming it is basically sound and at the moment I am not gearing up for war or to develop for a particular long term goal). Also note on the left hand side, a quick indicator of how content my population is. You can, rather usefully compare the costs of a considered structure with this information. At the least it'll tell you what any shortfall is and whether you can really afford it. Anyway, for the moment, I'm just going to cycle through a few turns. I'm interested to see the state of my economy once things settle down. 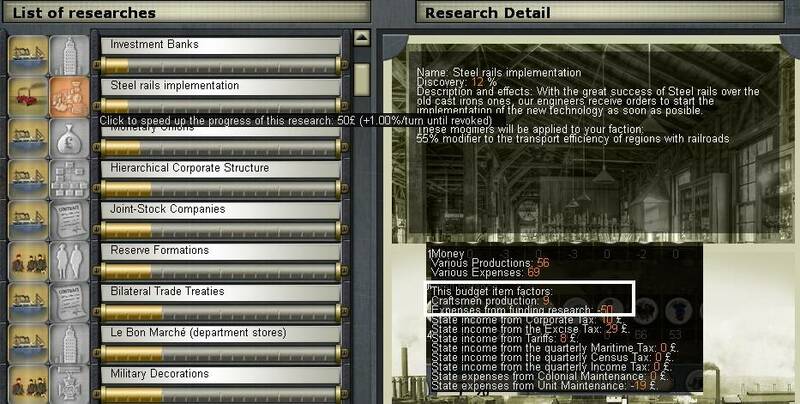 One aspect of the game is that industrial sites will close down if they lack input materials. So best to leave it for a few turns, hopefully it will sort itself out. Now in looking around, I noticed my money was dropping. A while back I'd decided to pay to speed up a particular research line (remember I am just trying out ideas). Well that has to stop. 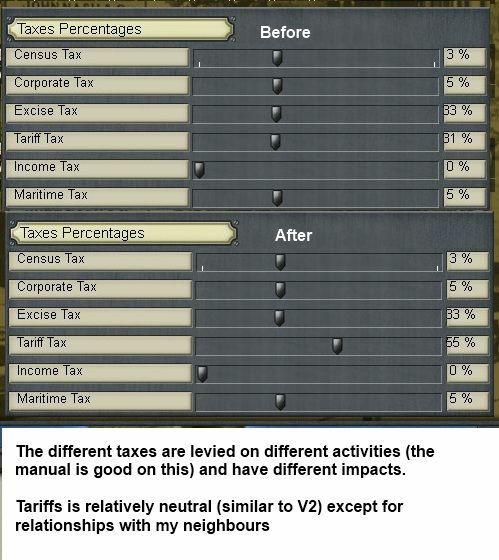 And I decide to increase tariffs, this has some adverse effect on relations with my neighbours but the money will be handy in the short term. 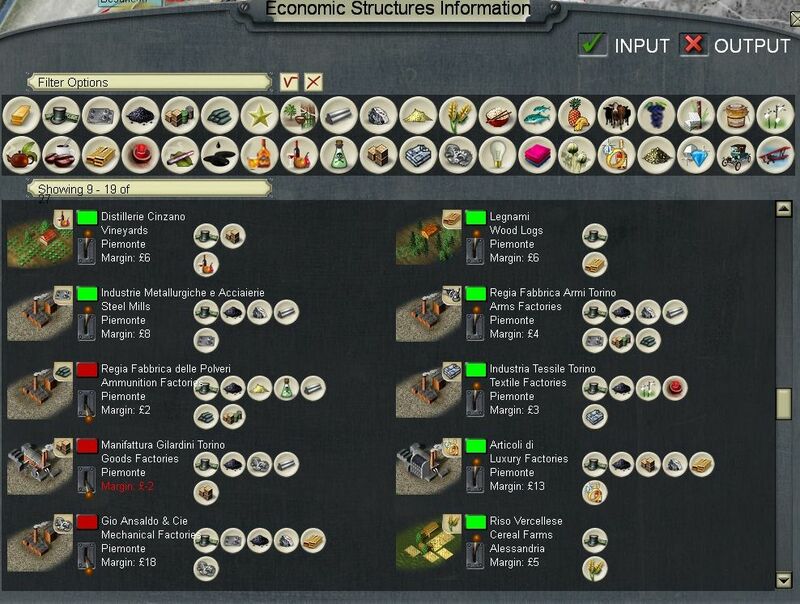 While delving deeper, lets have a look at my economy in more detail. 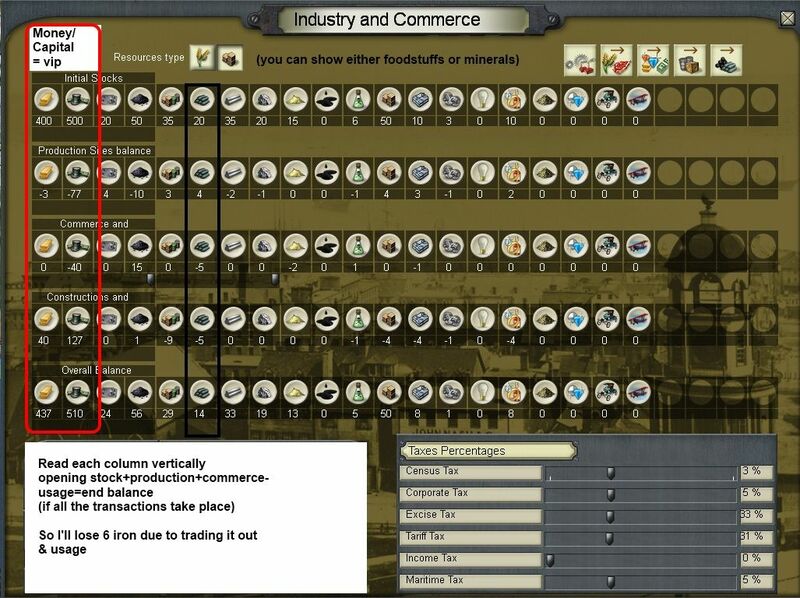 this shows which sites and factories are closed and why, as well as the potential profit if they were open. In this case, I'm content that the ammunition factory is shut but re-open the mechanical factory. In turn, I then check for that the problem doesn't lie with my imports (which it doesn't). I found after a while, this page was worth checking every 2-4 turns. It seems that things get closed if there is a temporary lack of imports and it doesn't always re-open. Equally you can sometimes address the shortage by juggling around your trading patterns, or looking for domestic production chains. You can of course shut down plants that are taking up scarce resources so these are then used by plants you are more interested in. This is also part of my logic to trying this out with S-P. In effect all these screens can be dealt with at a glance rather than wading through multiple pages. 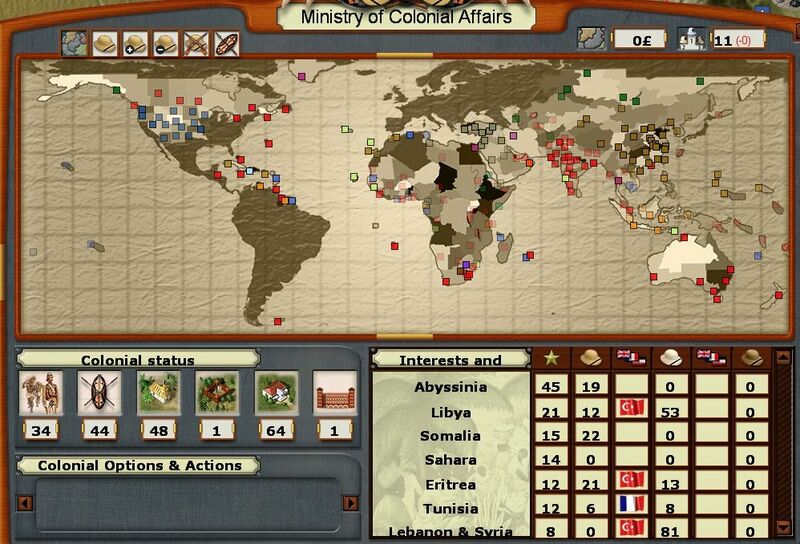 Anyway, next post will be less economics and more about colonialism and diplomacy. One has to engage with the wider world. germanpeon wrote: Awesome! I may buy this game when I get a better computer. I eagerly await learning about how colonization works. Narwhal wrote: Nice attempt, Loki100. 2Coats wrote: Informative as ever Loki00. 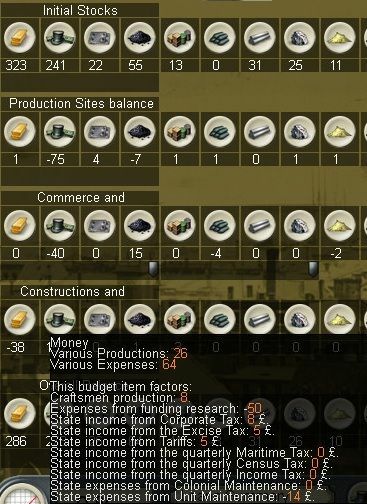 I found that as GB its much, much easier to balance production (not economy) from structures. Yes, there is a huge amount of fussing back and forth over certain goods. Coal is one, timber for some reason is another, as it seems you have critical gaps in your industry. I think in that respect Belgium would have been easier as you start with a decent store of raw materials, but I guess even less to do than with S-P. I file GB in the nineteenth century under 'too complex for me', even in V2 I find it daunting. 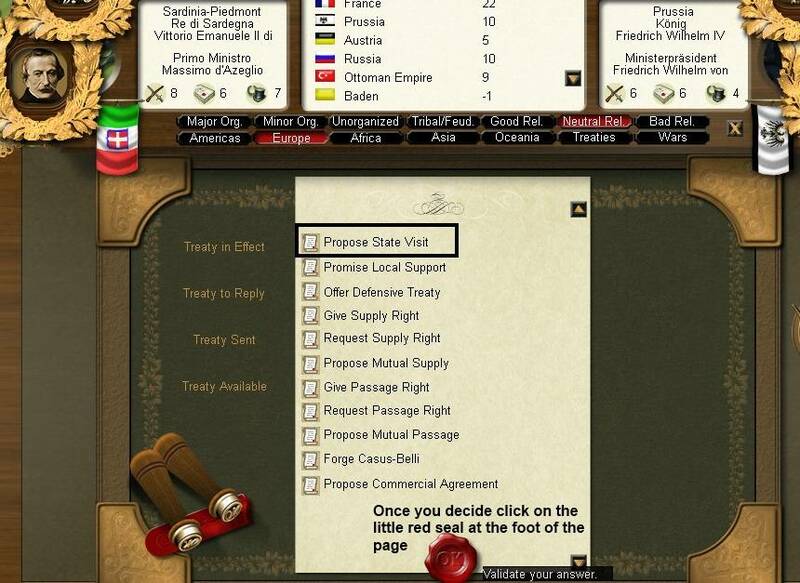 In this update, I'll discuss parts of the colonial and diplomatic systems. The manual suggests concentrate on Italy first and that is probably good advice, but the lure to do something is rather overwhelming. 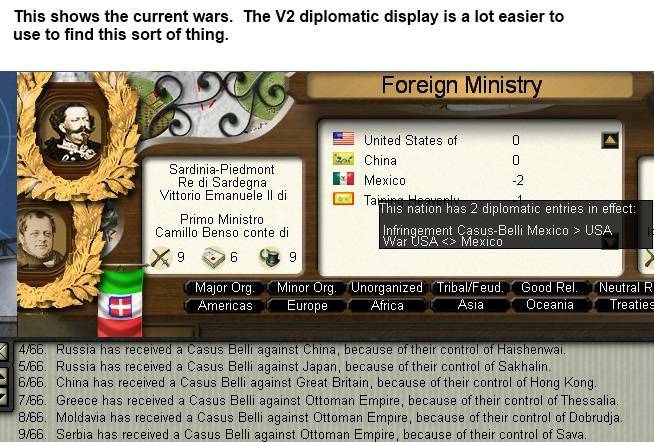 Also Italy is not exactly a major player in the diplomatic or colonial world so I don't think I can do myself too much harm. This is also a welcome break from obsessively monitoring my wood stocks (more on this later). 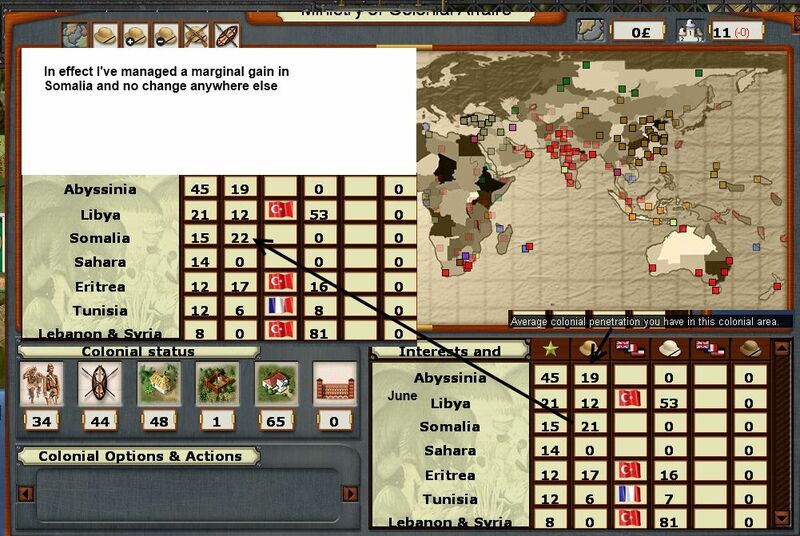 The colonial mapmode is one of the four on offer (right hand corner of the screen) and like the others it has a sub-mode where you can find the things you can build. This works like the others, click on an object and the map will go green (can build), orange (can't build) or light green (can build but can't afford it). I also, closely related to diplomacy, have decisions I can play. Again this is a map mode and you can select things to 'build' and places you can build them in. Italian Unification sounds a spiffing idea. So lets dump that on Tuscany. 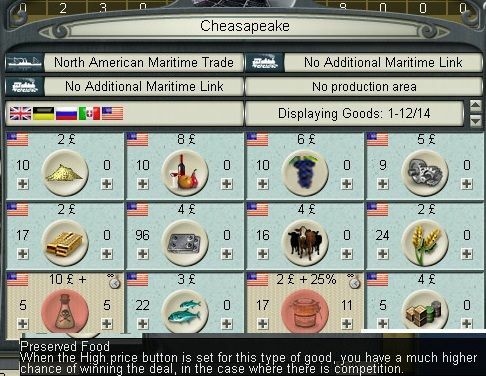 Now time flies while you are having fun on the diplomatic cocktail circuit, and I come to the view I need more merchant ships (primarily so I can either spread my trade network out or build some dominance in areas I already trade in). If I can't have a paid for holiday, I'll have a state cruise instead. In economic terms, the latter part of 1850 was a tussle over access to 2 resources. Should confess, I tried to solve this in isolation, I should have adopted 2Coats' solution of effectively stabilising all the assets and then worked out the remaining problems. Anyway, the first crisis was a steadily worsening lack of coal. This also had the advantage of easing a loss of my capital stocks. Quite simply I can't trade my way out of the mess. 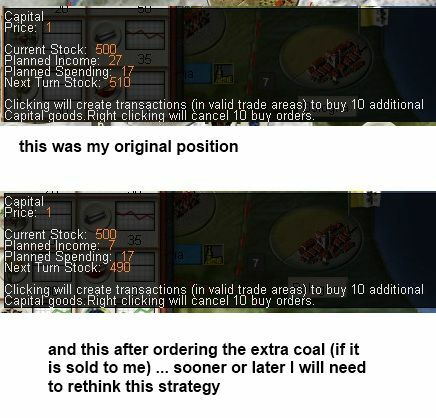 In effect, every time from now on the coal stock runs out, I just play this option. 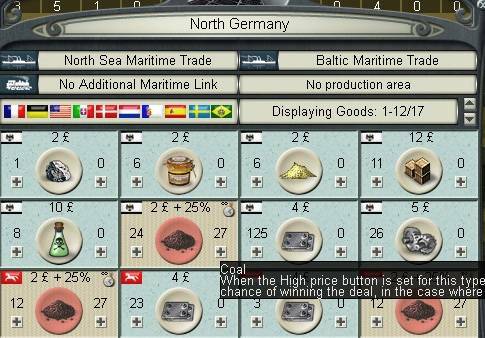 In effect 30 units of coal appear in my stockpile. Now I have 2 other solutions but they will take time – build a coal mine in Tuscany or France (but for either I need a commercial agreement and to be able to afford the mine). 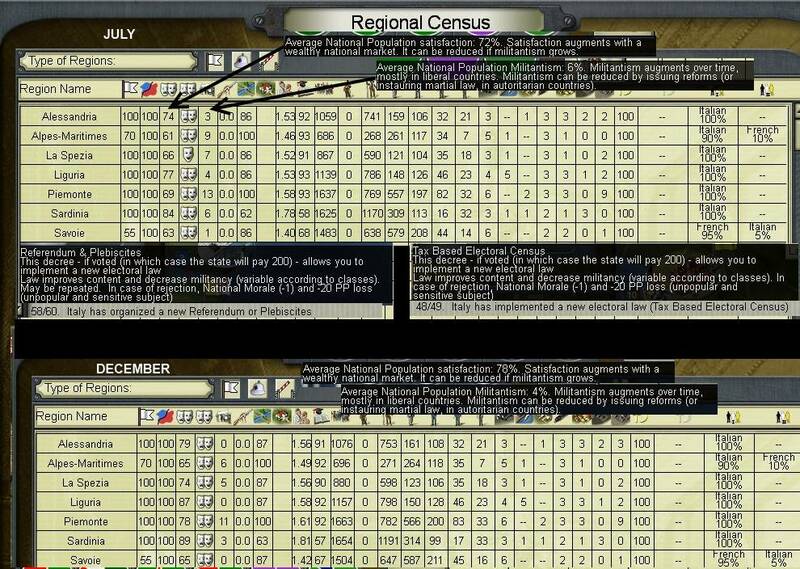 At this stage, I check out the Census screen. Now my overall happiness is ok, not good but ok at 51% (so that is up from game start), but it started to diverge by region. None of these are deeply worrying, just something to keep an eye on for now. By October, a new shortage has become my focus. Wood. Except I now spot a new potential source. 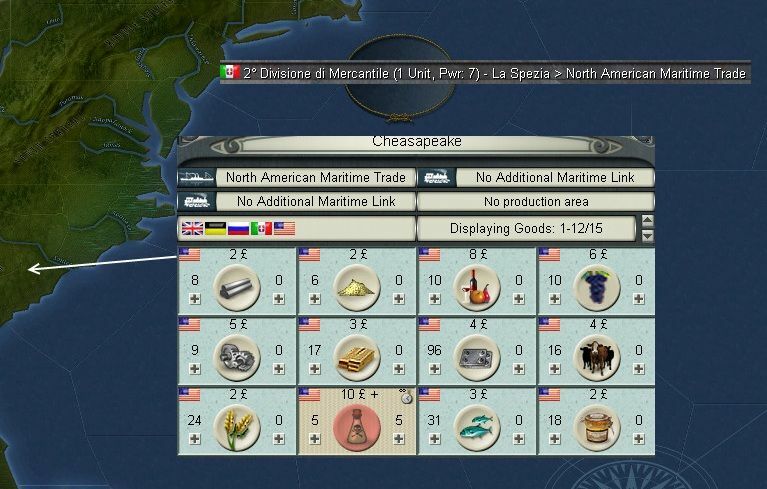 So I move the new merchant fleet from W Europe to the Carribean to trade with Mexico. 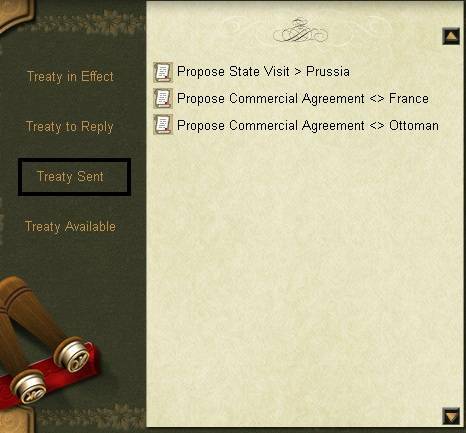 But that would mean a commercial agreement with the Ottomans and is in a volatile region. Equally, at some stage I'm plotting war with the Ottomans to reclaim the lands of the most Serene Republic (Venice) and grab bits of North Africa. But I can build a wood logging operation in France (who I am trying to make like me in any case). Thus ends 1850. 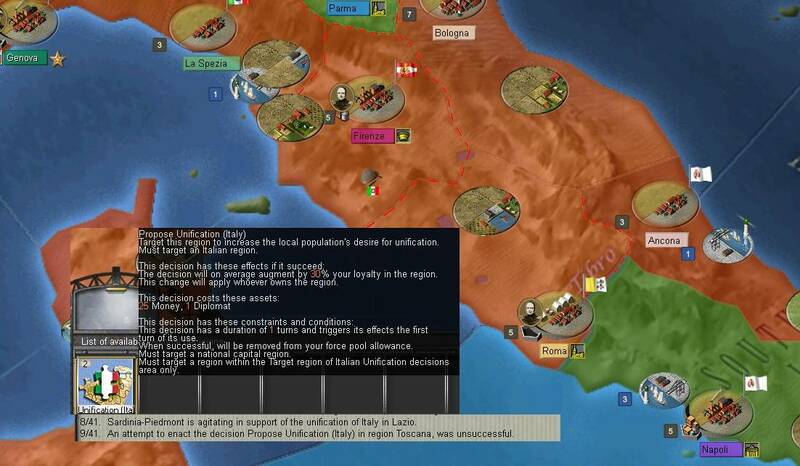 In addition I did some more sending merchants to the Horn of Africa and around Tripoli and played some Italian unification cards on Tuscany and the Two Sicilies. On balance at the year end my economy is mostly stable and I seem to have a solution in place for my two worst problems. The next year will see a fixation with finding enough manufactured goods to allow further industrial expansion. 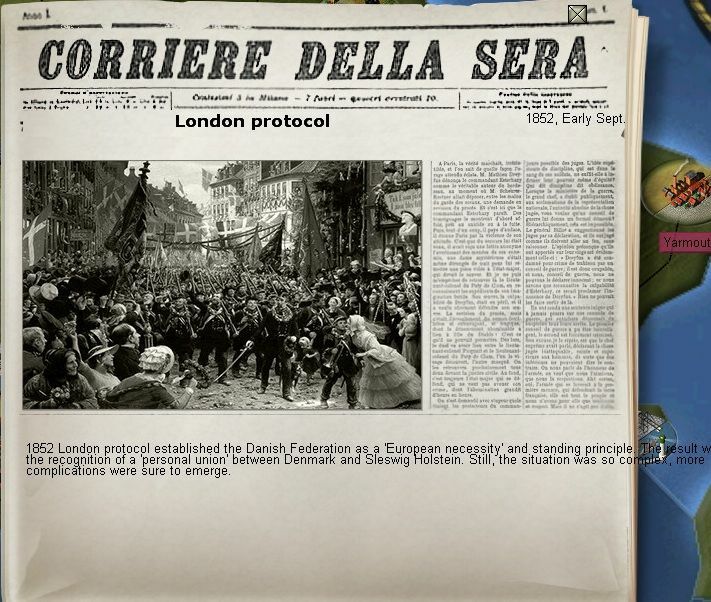 As mentioned at the start, I'm not going to handle this as a normal AAR, and in fact as the game progresses I'll compress more and more time periods, till we get to some action over Italian Unification. 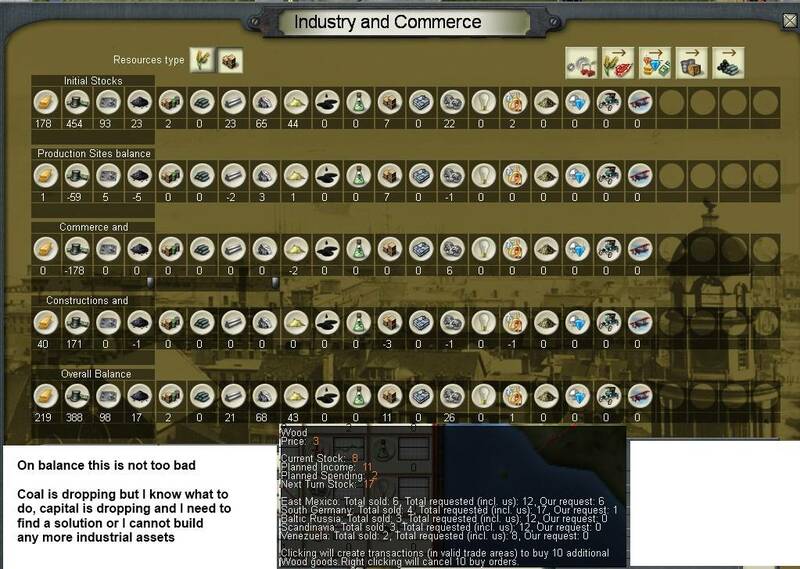 In game, I'm up to mid-1852 and have managed to produce a pretty stable economy so what I am going to do is concentrate on how I got there. This post covers January to April 1851, mostly on the economy as that was my focus with a sideshow of diplomacy and a salting of colonialism. Now so far, I've worried about buying the goods I need. 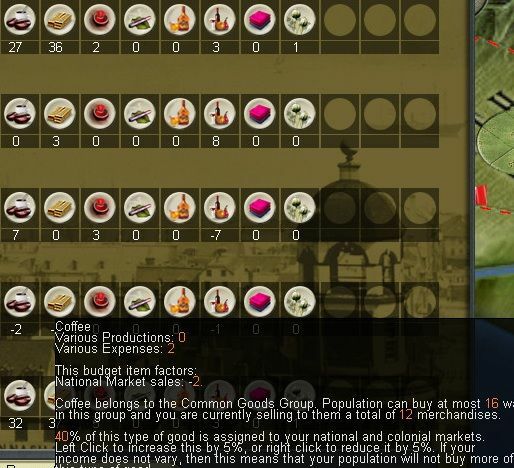 At the start of 1851 I decided to see if I can balance up my economy by selling stuff too. For this you need the trade map (you can access this by pressing T or pushing one of the little buttons that surround the world map. So as we can see above, at the moment my fish stock is growing. No gain to this so I'll sell some more. I opt to end by only keeping 69 and sell 3 (as you can see I've also gone seriously into the wine trade). I'll let all these changes run a couple of turns to make sure nothing is unbalanced. 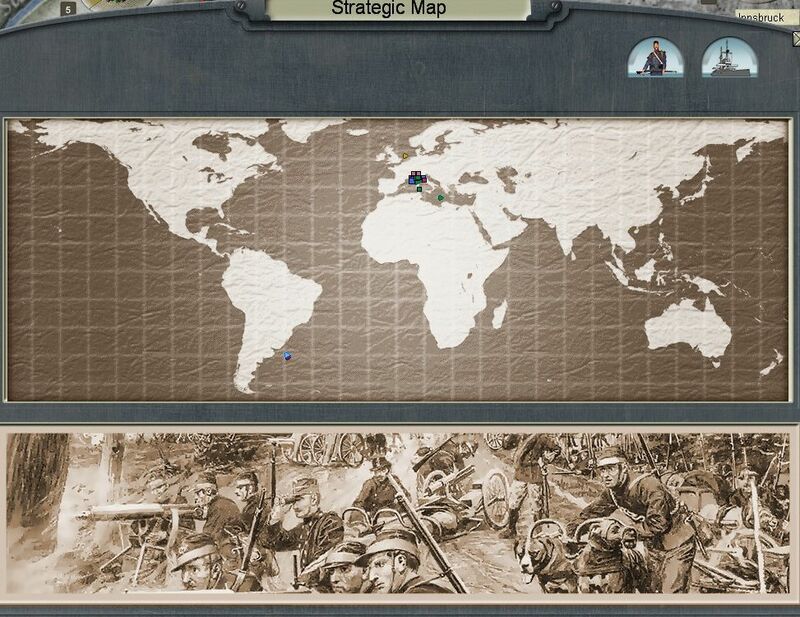 Now while I am being all economical, the French are still whinging about the size of my army, while Russia seems to be planning WW1 all on its own. As we will see later, Russia takes these CB options very seriously. Anyway back to the economy. This is the trade screen a bit later. 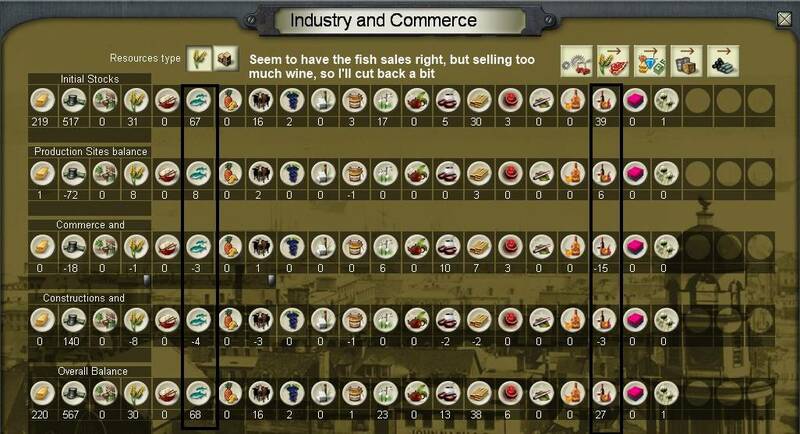 Fish seems to be in balance, but I'm selling too much wine, so I cut the sales back by a bit. 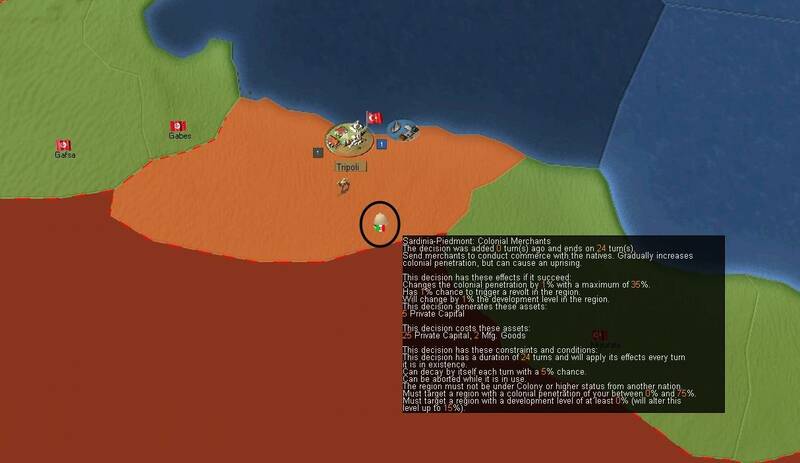 For a bit of sport, I carry on doing colonial actions, mainly around the Horn of Africa and some in modern day Libya. So again opt to solve this by subsidy (ie effectively buy a stock of 30 to tide me over). 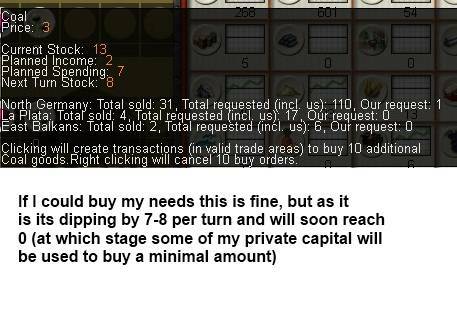 However, this is becoming a recurrent problem, that I need a better solution to than just buying in a stock and nursing my usage till the next time I can play this option. My fundamental problem is even before I can think of building a coal mine somewhere else I need to get both Commercial Agreements and enough Manufactured Goods for the purchase. Ideally I'd like to build one in Tuscany (on the assumption that will be mine in the end) but if needs be I'll pop one down in France. I also want to build a railway east of Torino to link up to Milano. As to my future plans. 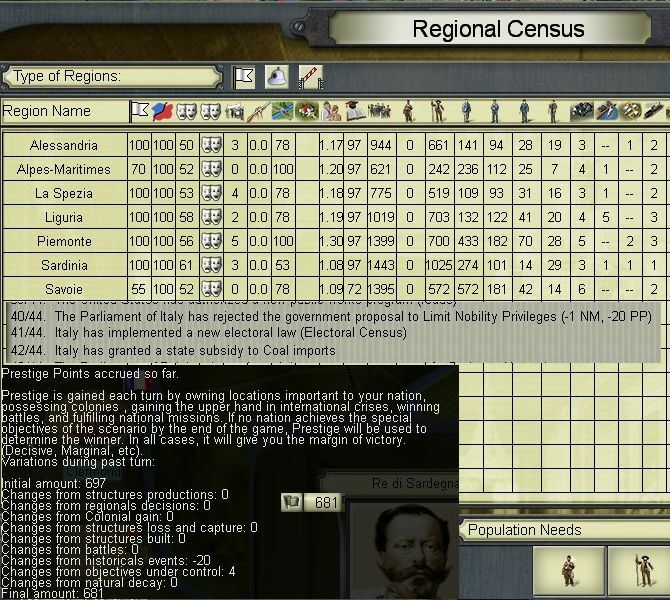 I'll stick with the original idea and play this till I have the 1870 boundaries of Italy (or its clear I've failed utterly in that goal). There is a new 1.3 beta patch available on the AGEOD forums but I'm not going to download that till I've wrapped this up. Even if somethings change, I think keeping on with this is of use. 2Coats wrote: Super update Loki100. Pretty similar panning out of action for me too, though alot of different events for me. 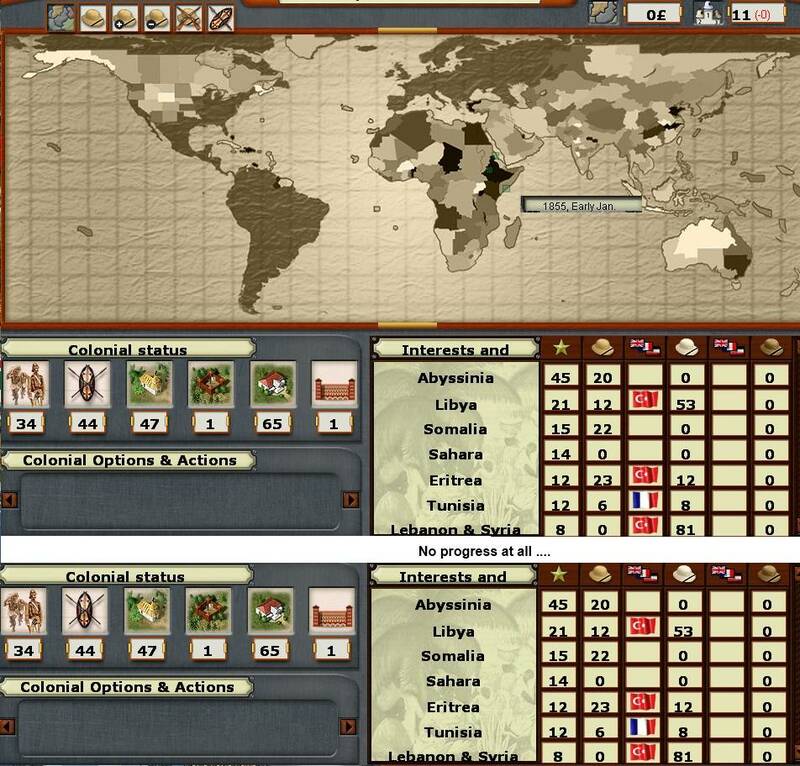 The main thing is that the game focus' colonial expansion to the historic areas of the globe for the nation being played, and even though you can strike out to areas that were controlled historically to do so take a monumental effort. 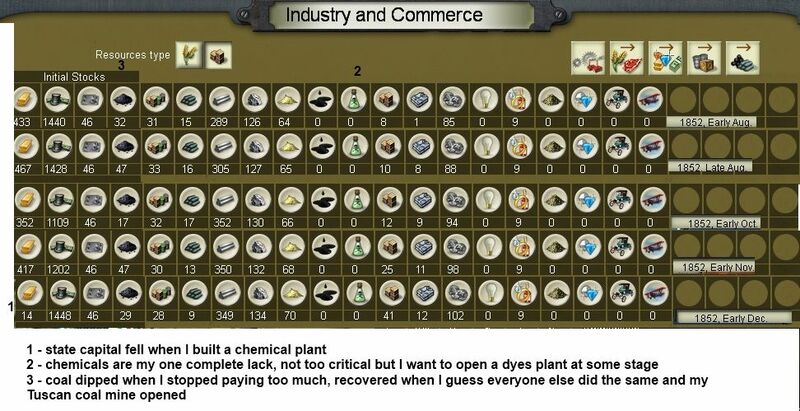 Re: economy I had problems with chemical and then mfg goods also. The thing that gets me is the lack of control in terms of structures. Or at least thats what I thought until I turned off conversions and switched off the buildings. 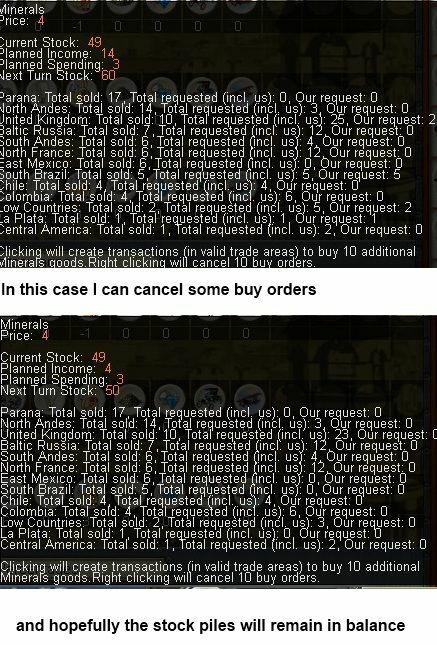 Cancelled all imports and exports. Then I activated the buidings one by one watching for the changes to the commodities needed. 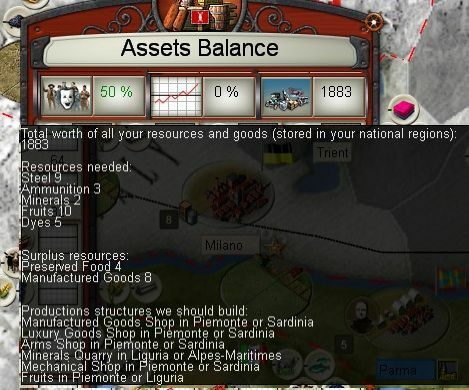 By around the same time as your update I managed to actually get the economy balanced and had all my buildings back on. There is a trick to it, which Im writing up as I type - but its just not that intuitive. Better screen/interface design would have helped here. 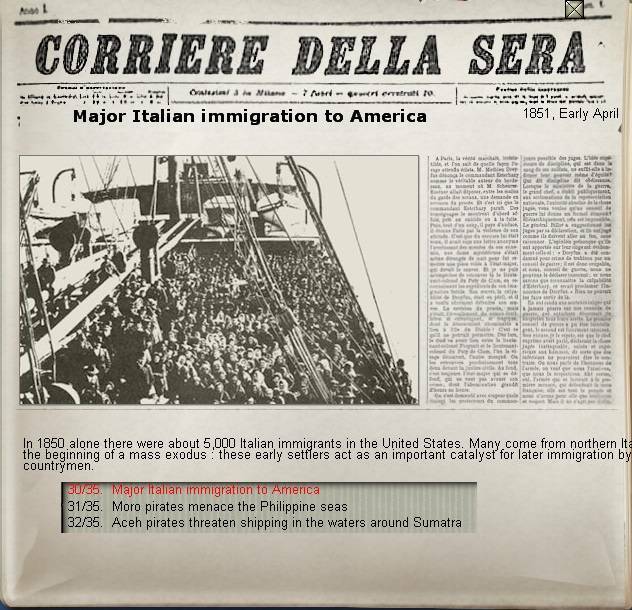 Anyways...I wonder how the immigration event(s) will affect your census. 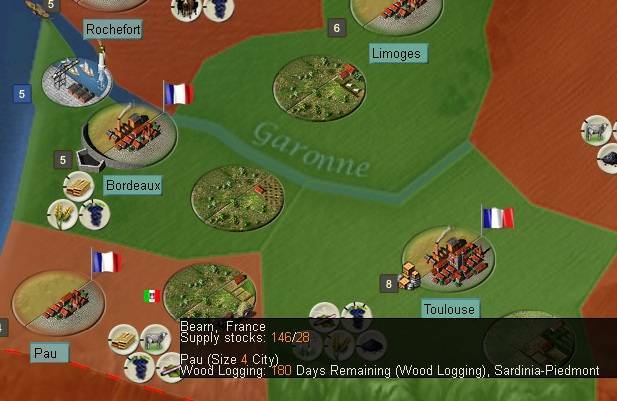 In my game Im getting the first signs of revolts in some of my unhappy (read French) provinces. Colonially though its going pretty well. Unfortunately most other areas of the game S-P ranks have fallen rapidly! Avoid the beta-patch, at least for a few more years. Good luck w/ the rest of it. EDIT: One of your pics is broken. 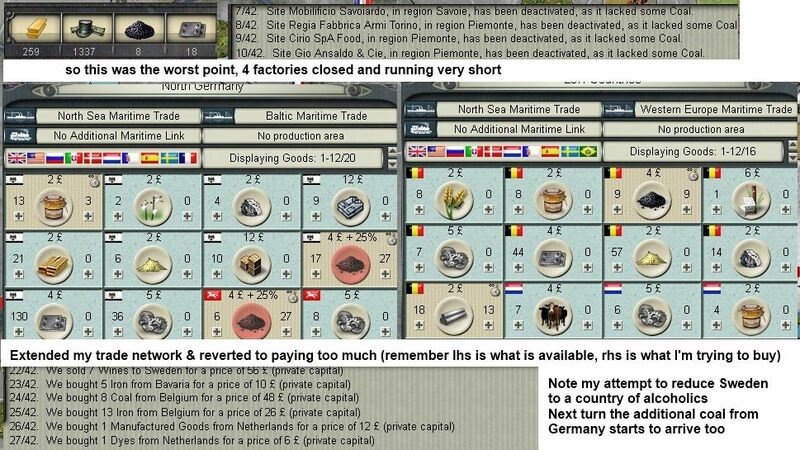 Agree about the beta, in any case it won't change the things I want to explore in this AAR. 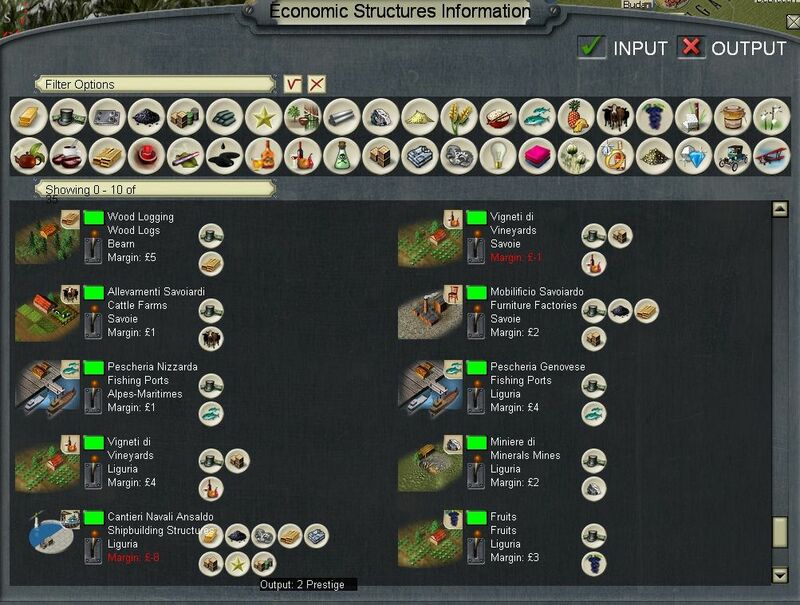 I suppose I'm more interested in setting out the various economic and diplomatic management tools -which I guess will say much the same - than any particular gameplay. By Summer 1852, I think I have a viable economy, but I really should have done your more systemic approach as opposed to my rather piecemeal one. I actually drive up population happiness by passing laws etc. Its a bit costly in terms of prestige (if you fail), but as in the next post, it really does pay off. 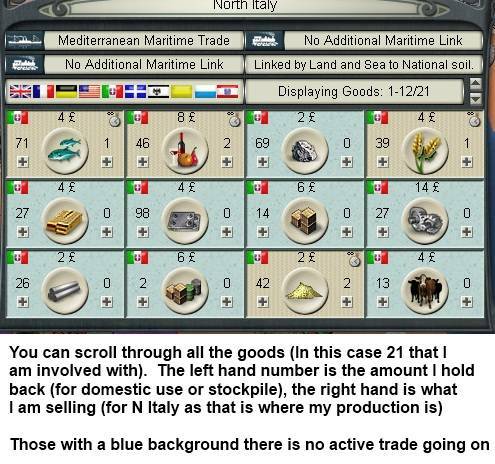 Ellesthyan wrote: One little feature that you both might have missed, is that it is possible to alter the percentage of goods sold to your national market. This can be done in the f4 screen, by pressing on one of the goods icons in the fourth layer. A left click increases the percentage, a right click decreases it, for a maximum of 80% sold to the national market, and a minimum of 5%. One or less stocks results in zero goods sold to the national market. This is vital as it will allow you to sell the maximum of stuff to your own population, increasing happiness and giving you a reliable source of income. Also it is possible to minimize the selling of important goods such as mfg. 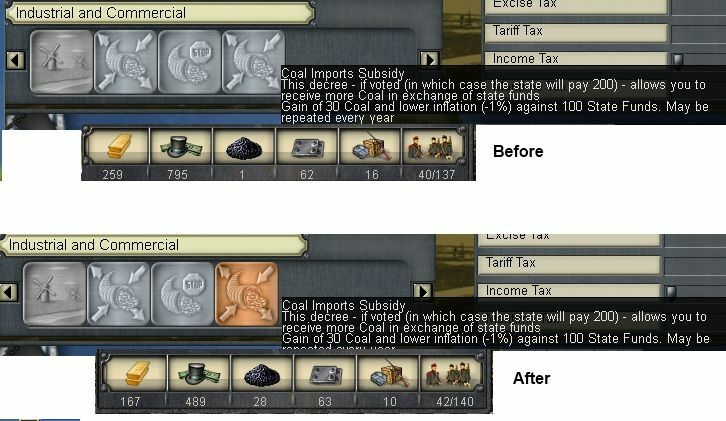 goods or coal, by setting the percentage sold to the national market to 5%. If you already were aware of this feature please disregard, otherwise I hope it helps! Thanks for that - I wasn't aware of that option and it might have been invaluable both for economy balancing in terms of allocation of key goods, happiness and boosting income by domestic sales. When I restart the game (I'm up to June 1852), I'll explore the potential of that. baris30 wrote: Excellent. I recently re-started playing this game and looking forward to reading your AAR. Stuyvesant wrote: Yet another AAR, loki? Pulling a Rensslaer, are you? I think you just have to take this one slowly. A few times I have just jumped through some turns but that is rare. It might work with the US or UK where you are either pretty isolated or have a robust economy at the start, but I'm finding with S-P that even once I get the economy sort of stable, there is a lot to fuss over. So if I play for 45mins-1 hour, I guess I get through 4-5 turns. On that basis there is no point taking into account that this game lasts almost 1450 turns. I think the other consequence of that is being prepared to take your time. In RoP I've come up with a view that with the Austrians in the first year you can't win (so don't push it) but you can lose - I guess this one is the same on a larger scale. You can probably wreck your economy at the start, but you are not going to win early (even with my own invention of what a legitimate end point consists of). In addition to my new coal crisis, I decide to explore other ways to cheer up the populace (ok they are cold, the factories are shut, but I demand that they can be happy). This I opt to do by passing (or trying to pass) certain laws. Some of these you find on the government page, some on the census page. In this case, the new electoral law was passed but they decided to protect the aristocrats. At least I have some more coal now. Anyway I decide to explore if there is anyway I can optimise my growth. 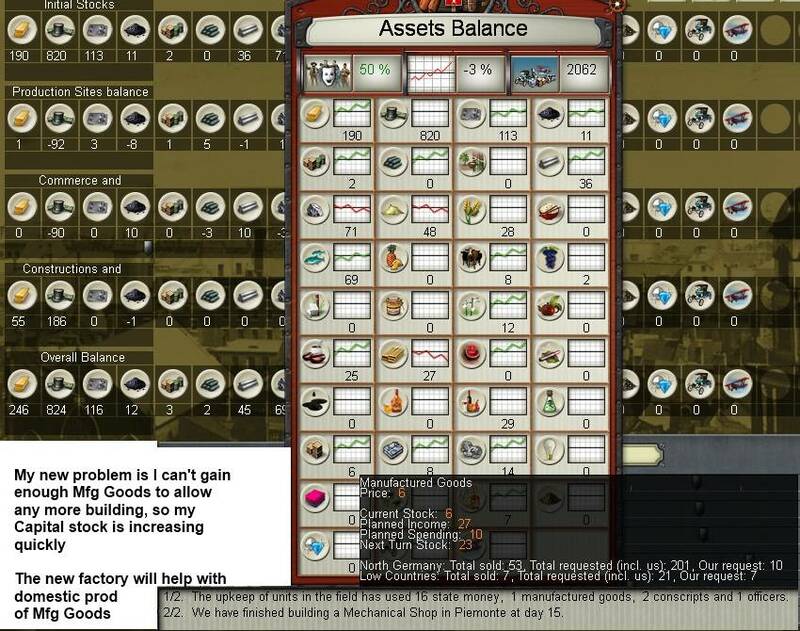 My working factories take 5 Mfg Goods per turn to operate but are so profitable I'd rather not shut any down. 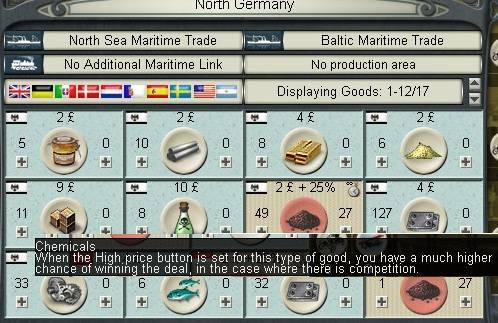 I'm producing 11 per turn if I can make the shipbuilding factory stay open (I can stand the cash loss). In any case this should give me +5 per turn. 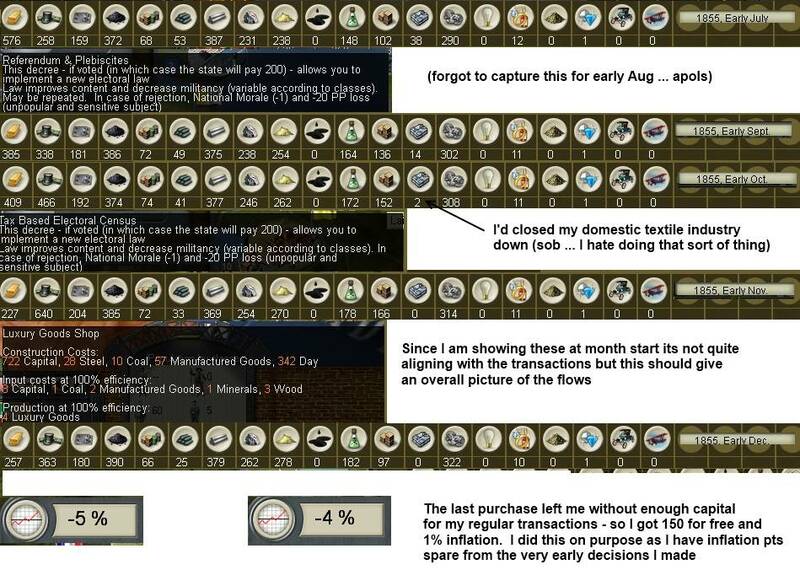 If you are hunting a particular problem, going over this screen with care can really help you understand the key flows in your economy. Come 1852, we will be back on this quite a lot. 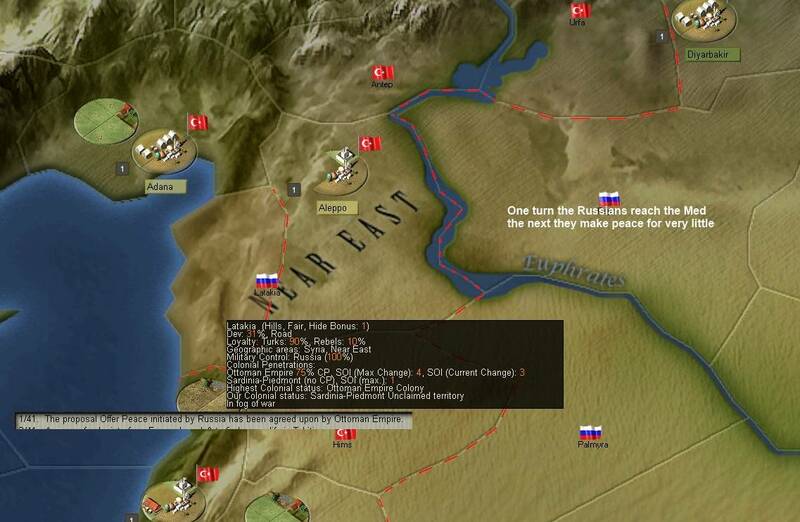 Anyway, Russia has stormed into E Anatolia. Over the next few months it looks like they will eat the Ottomans in a single campaigning season with no response from Britain or France. I start eyeing up the possibility of a bit of action on the E Adriatic or N Africa where I have valid claims. Still with my new stockpile of Mfg Goods its time to build. As with Victoria, railways give large boosts to productivity, equally building in Alessandria will conect Turin to Milan (a move that appeals for some reason or the other). Having spent my Mfg Goods stockpile, I replenish my stocks of those and coal. Again, I have 30 of each now. 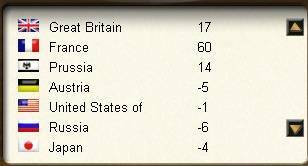 Even while I am being so industrious, the Russians are wailing on the Turks (my guess is their NM is over 100 due to victories in the war. And the Russians approach the coast. So there we have it. 1851, a year of coal shortages, hard nosed parliamentarians and a nice shopping trip to Paris. 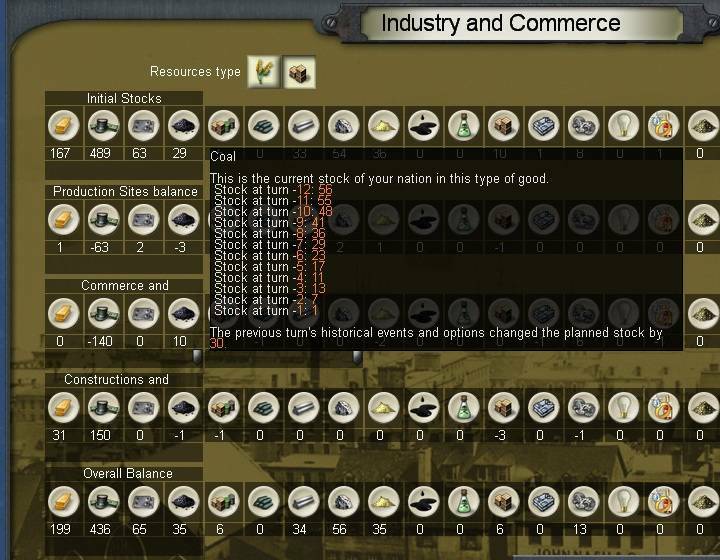 1852 will bring me a new Mfg Goods plant and a shiny rail extension. And, at the moment, the economy seems under control. As we will see this optimism is the result of too much grappa at the Festa de Bufana. And, of course, Russia is well and truely stuffing the Turkey. Powloon wrote: You have mighty stockpiles of fish and cereals is there a reason you are stockpiling them or are they jusy not selling? I have had a hard time working out if there is any advantage to maintaining stockpiles of food stuffs that I am producing over and above my domestic need. It has certainly been profitable selling them off. I think the stocks built up before I could work out how to sell more. I'm happy they are stable. I did try (not next post but the one after) to sell them to my domestic market but they are already eating as much fish as they want (picky b*ggers). Every now and then I revisit to see if I can sell a bit more as I agree, they are easy to produce and quite a good source of cash at this stage. Don't forget that you don't need to be completely self-reliant: steel, mechanical parts and even manufactured goods should be available for import. In your shoes, I'd focus on agriculture, which only needs capital investment and is absorbed by your internal market. I'm doing a mix. I've built one cereal farm (more risotto - yeah) & a bit later a new fruit farm (grappa) and they are good sources of cash. I have noticed a bit of a slow down since the war started. Must admit I've been surprised at the total indifference of everyone else to what Russia is up to. Stuyvesant wrote: S-P is chugging along like the Little Engine That Could, the Russians are beating the stuffing out of Turkey and I spy that the Chinese have already managed to rack up 100,000+ combat casualties... Sweet Jesus, that's a lot of people dead, even for China. Yes the Chinese losses are a real shock, in about 4-5 months as well, so no idea where that is going to end up. hgilmer wrote: Nice! Thanks. I never knew that. As someone else said, I'm learning a lot from these AARs. I'll split this year into two parts. 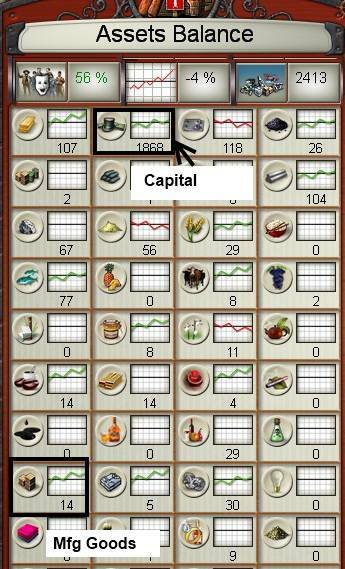 Up to about June I struggled with various approaches to stabilise the economy, after that, with minor problems, it seems to have run pretty much on its own (I've played to the end of October 1852). 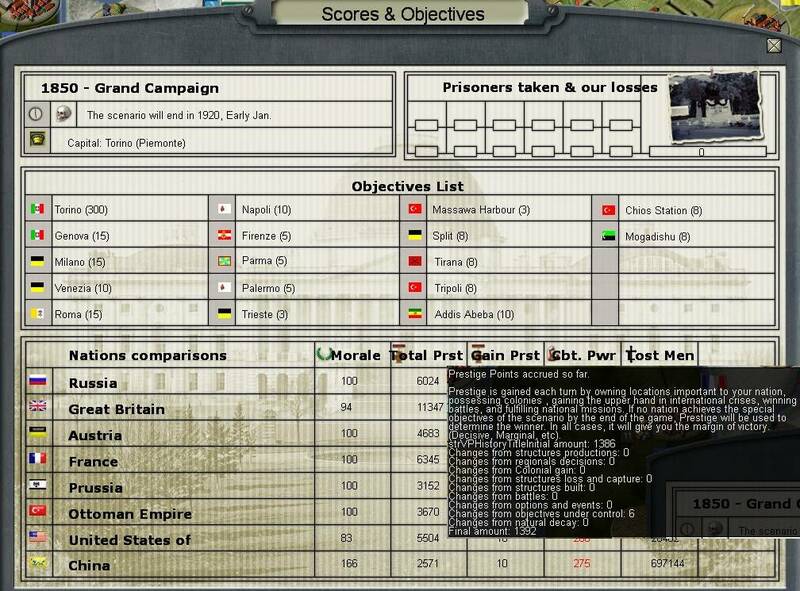 Again, this post will be more 'what I did' than a conventional AAR. If the economy does stay stable for the rest of the year then I'll do relatively short end of year reports unless there is something particularly worth exploring. 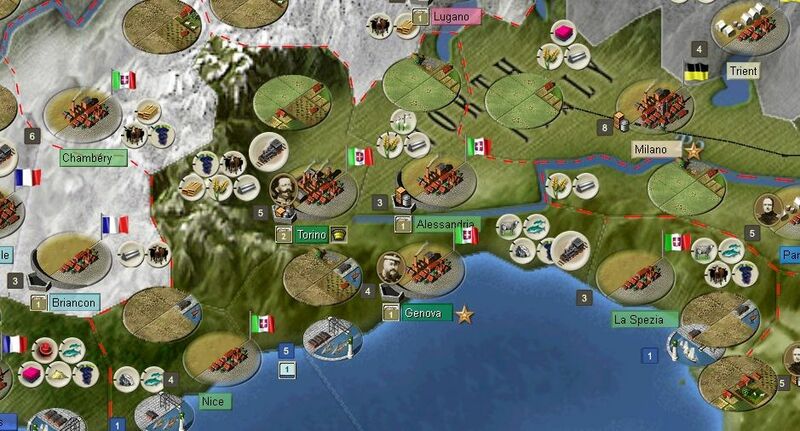 Hopefully the Italian unification events will start firing around 1858. 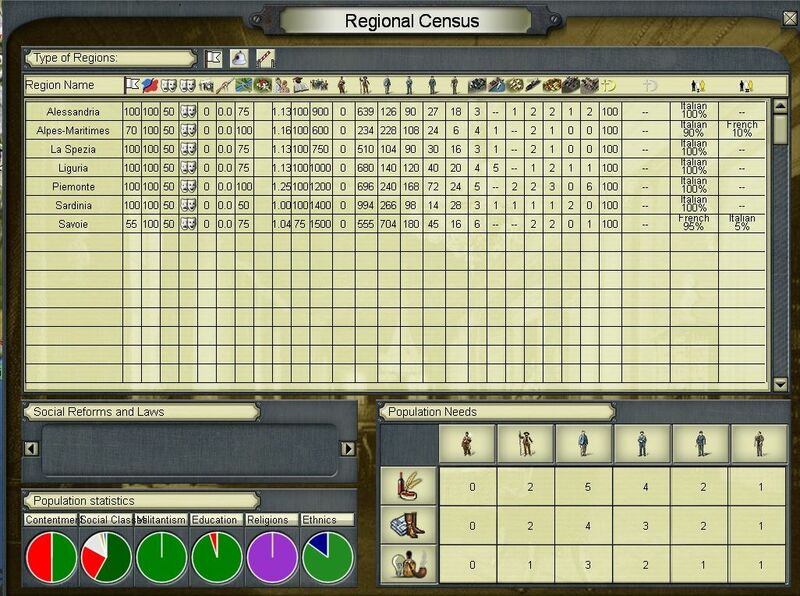 And, the population was pretty cheery, this being the result of reforms and meeting their economic needs. Dies, coal and manufactured goods were my problems. This is partly linked as the coal shortage is closing my factories that make Mfg Goods. 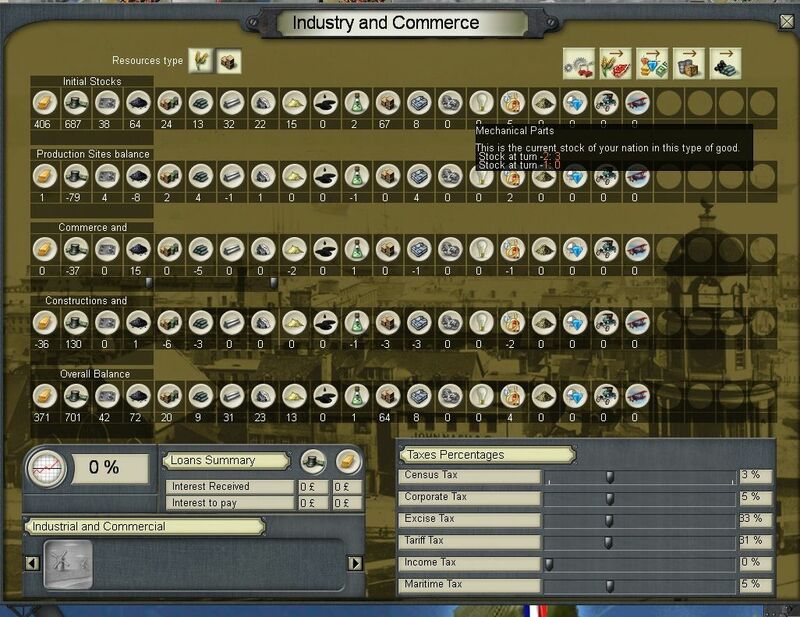 So I shut almost all factories down except the most profitable or the ones that in turn maximise production of manufactured goods. In this case on the lhs is what is available and on the rhs is what you are trying to buy. Equally you can try to outbid the competition by paying more. Well money as such is not a problem at the moment. I do the same in N Germany too. This dropped off a bit in subsequent turns as I suspect other buyers matched my offer but I was pulling in enough to cover my needs. So once that is in place, I can probably stop paying over the odds for coal on the market. 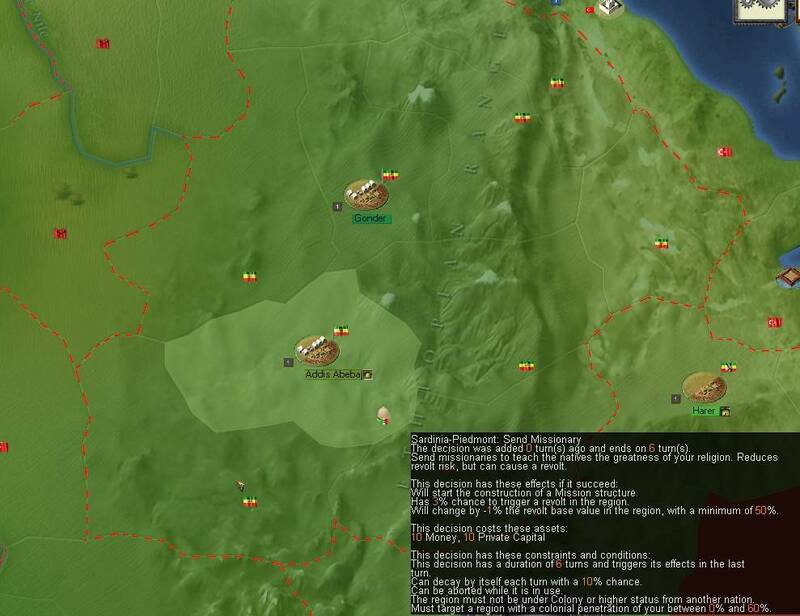 Anyway, I have fantasies of grabbing land from the Ottomans, so decide to build my very first military unit. Marines seem to be a good idea. So thats us upto mid-June, and for the most part I have a stable economy that is slowly growing. 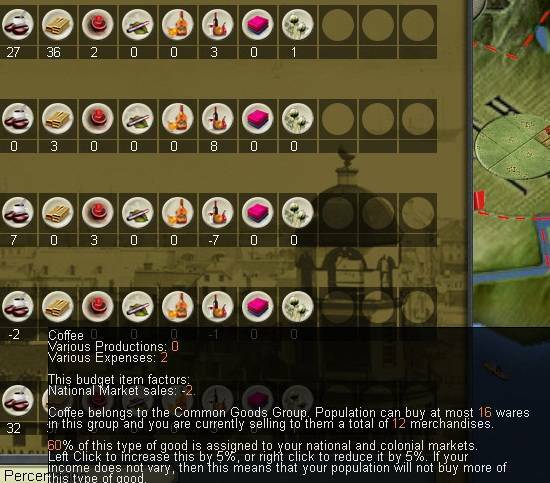 In the next post, I'll explore how to sell more goods to my own population and the economic and social benefits of this. Right, since you so annoyingly rekindled my interest in the game and I have a few hours to spare, I'm off to redo the tutorials. well gondolers are sort of marines aren't they? Or is it the other way around? And I guess its a sign from on high that I need Venice now I have a properly dressed workforce? hgilmer wrote: One thing I noticed... and I'm not sure it will help you or not because it doesn't seem like you might get this chance. I'm playing Prussia. 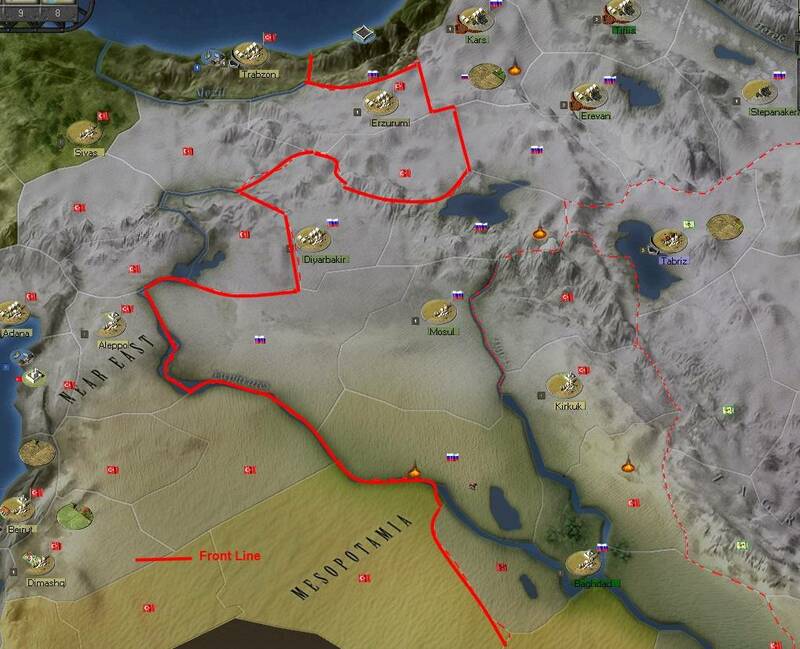 Russia just had a few revolts and the rebels took over a few provinces on my border. I was able to just waltz right in and take those provinces with no casus-belli or war or anything. I had moused over the rebels and it said "At war with your nation". So, I figured, if you're at war with me, then I can just take your land. And I did. I have added 2 regions so far and possibly a 3rd next turn. Not very developed, but ehhh, it's land. Sorry. I know this is sort of off topic and probably is mentioned on the regular boards, but I figured some of you might be able to make use of it. Edit: Never mind this. It looks like Russia just gets to take it back whenever they can just push me out. germanpeon wrote: Excellent update! 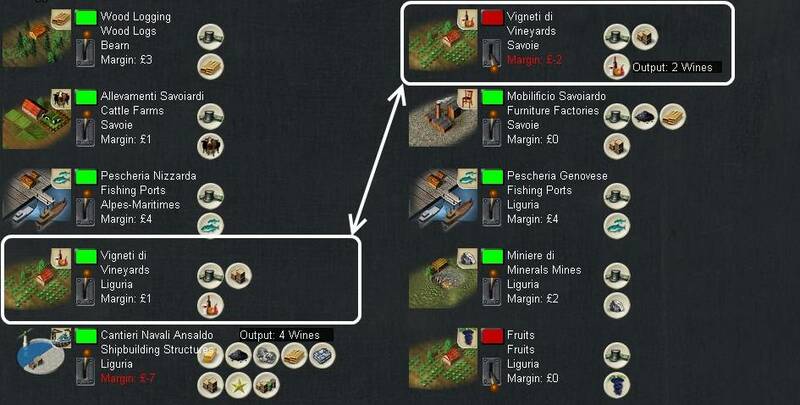 That investment in Tuscany looks to be a very valuable step in balancing your production chains and economy generally. Should Tuscany eventually decide to join Sardegna-Piemonte in total... all the better. 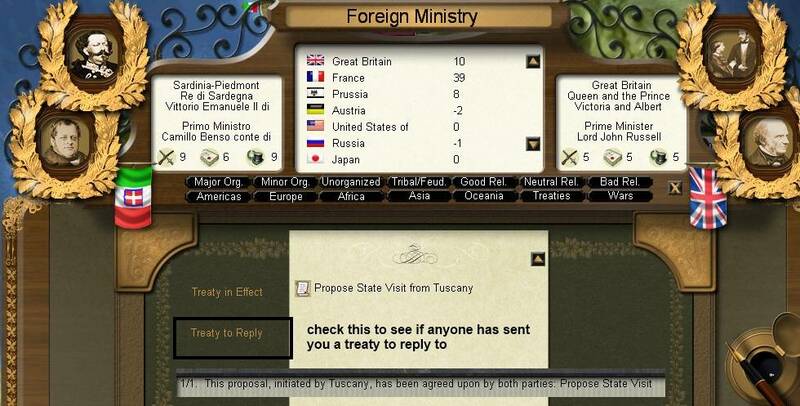 Speaking of which, how much progress have you made in swaying the loyalty of Tuscany toward your cause? As for those hats... I'd like to see the man who could face such a hat in battle and not break in panic. More seriously, I'm sure they'll be quite useful in your colonial endeavors in concert with naval support. 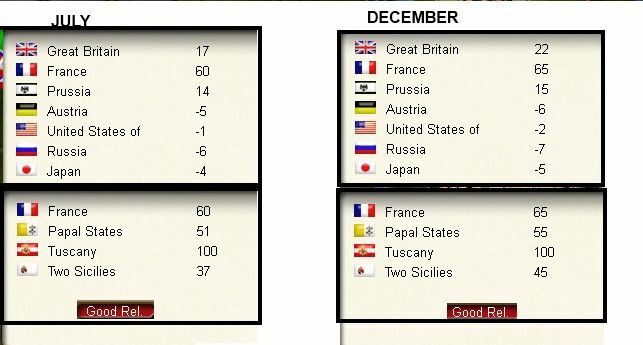 Tuscany has responded well to my efforts with the unification cards. My mine is pretty safe and hopefully will be incorporated by the end of the 1850s in any case (this was why in the end I decided against building in France). This report covers the second half of 1852. In truth not too much happened. By a process of luck and some adjusting as I went along I've mostly stabilised the economy. The final shift to what I have been doing so far is to start selling more goods to my domestic market (good for population contentment and taxes etc). The first table shows the values of key goods at the start of each month (ie every other turn). I've picked this as it is a clearer indication of flows than looking at the potential changes each turn. And I decide to exploit my agricultural resources some more. When up and running this should be a stable earner as it only needs capital and fruit sells pretty well. A bit later, I build my last available small merchant ships. These end up being sent to improve my trade with N America. There are chemicals available there which remain my only real industrial choke point. I also decide by December, to build my very own chemical plant (it was a choice between this and extending the railway to La Spezia). I can sell them more coffee (I'm buying a lot from South America) as this is part of the 'common food group' (PoN brings together goods into broad categories so you can keep your populace happy with various combinations). Overall I'm doing well with domestic sales for both happiness and taxation as this report shows. By the end of November, Cavour has turned up. In bigger international news, the Russians reach the Mediterranean and, then, strangely settle for a small corner of Bessarabia. The latter two are related to my playing of the unification cards so I guess its more a comment by the population than by the rulers? Stuyvesant wrote: You didn't really write that 'The Pope must be grateful for all those missionary positions I'm creating in NE Africa', right? I just misread it, innit? 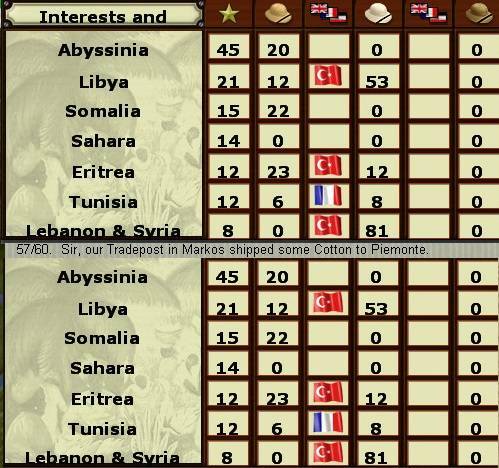 So, economy stabilized, populace happy, neighbors friendly, Russia didn't even eviscerate the Ottomans... Things are looking pretty sweet right now. 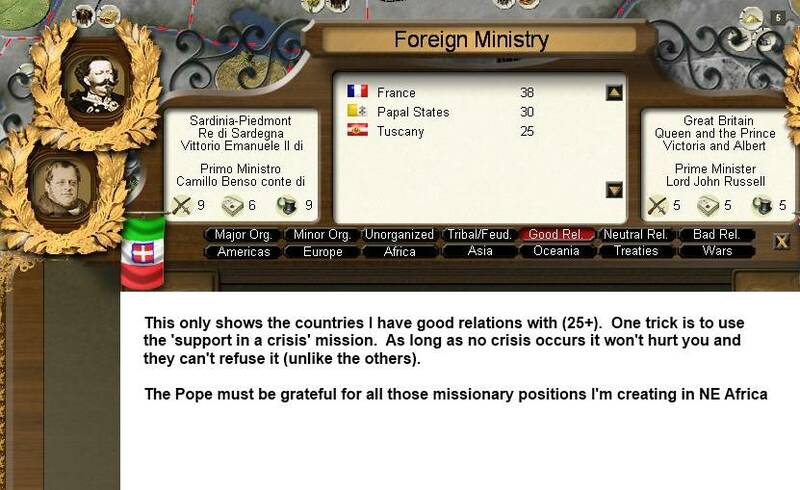 well I am sending out missionaries to all sorts of positions ... so I presume the Pope is very chuffed at my variability in matters of such importance. About the economy I hope so. The first half of 1853 (next post) was a bit up and down, the second half has been very calm. So I'm trying to add to my economy but not in a way that destabilises the whole thing again. 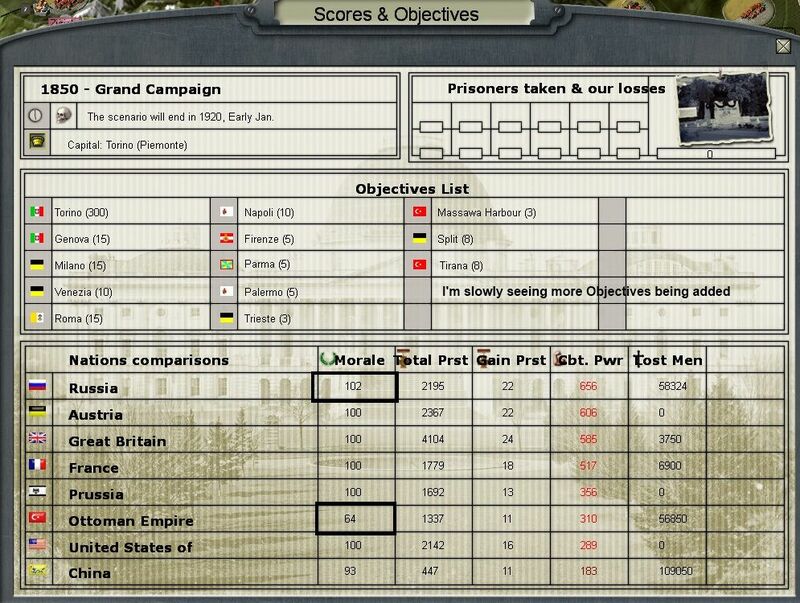 Bornego wrote: The Russians settling for a tiny bit of Bessarabia must seem very strange to anybody used to the EU or the HoI series, but it's typical for PoN. Even aquiring a single province in a peace-deal usually requires a very high warscore. 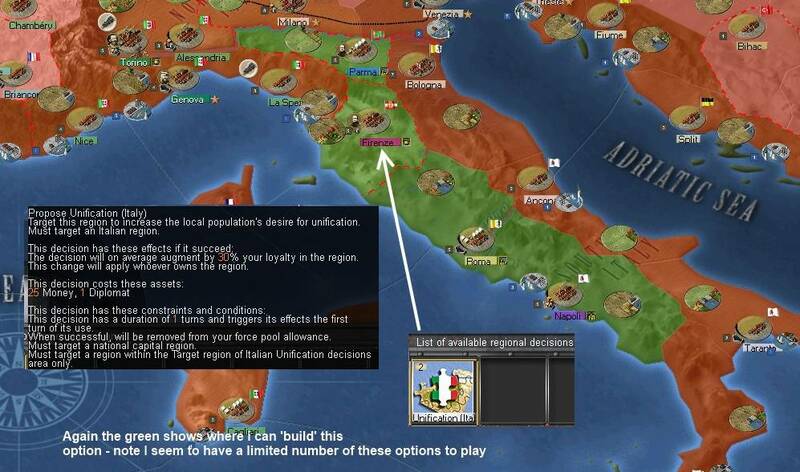 Moreover, you can only get provinces for which you have claims (there is an option that allows you to claim any province bordering on your territory, though). I think the Russians got what they wanted as that was the original CB. 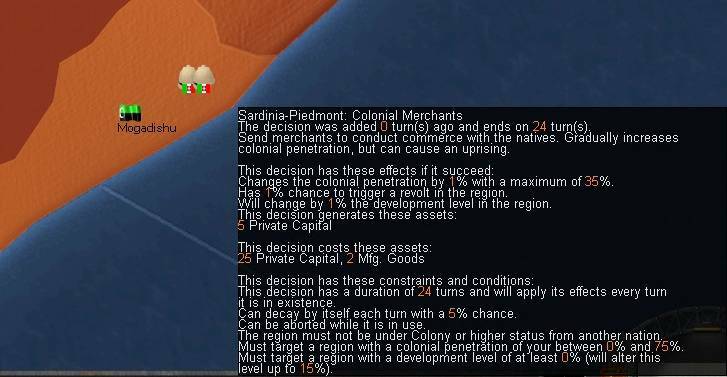 Its good to see that PoN forces powers to restricted limited war gains, equally it would be good if late game this restriction relaxed to allow the more destructive mindset that led to WW1. Actually, the Schleswig-Holstein Question will be familiar to anyryone who play BOTH Victoria II AND Crusader Kings II. Unfortunately, it is in Spanish. 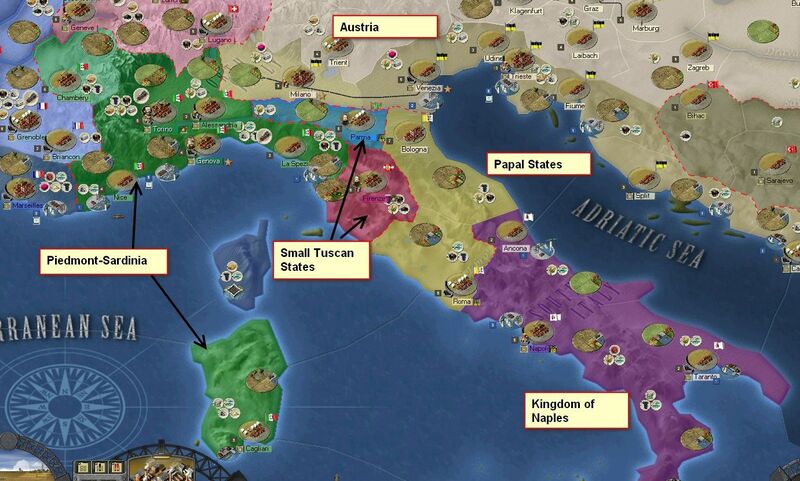 I was able to unify whole Italy, but I was unable to retake the Austrian provinces. This update covers the first half of 1853. The main event was a return of the coal crisis (linked I think to my decision to stop paying extra). After a bit of scrabbling around, I reverted to paying extra and the supplies continued to arrive. Other than that, I carried on smooching with France, cuddling up to Tuscany and pleasing the Pope by creating even more missionary positions all around the bits of Africa I'm interested in. 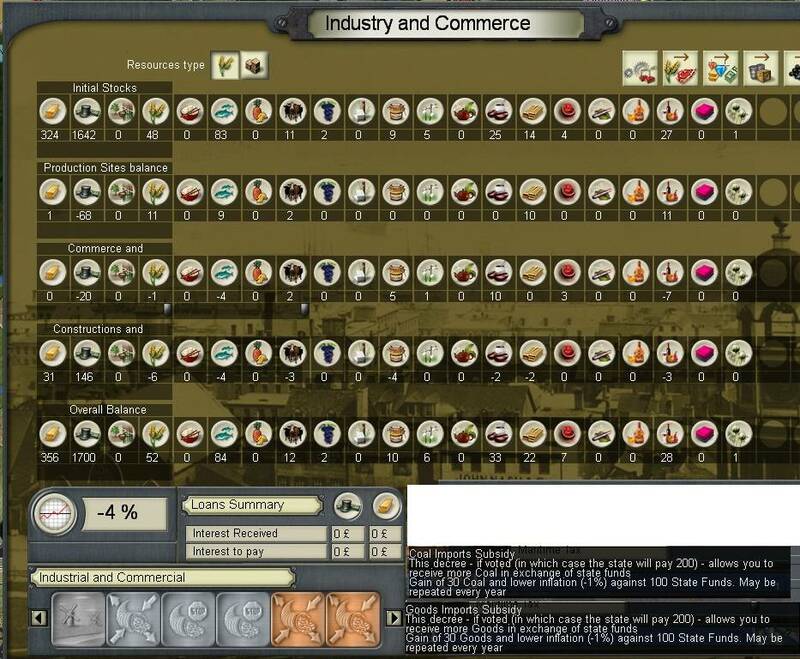 The first two screenshots show the position of the F4 (industry and commerce) screen at each month start. I find this shows actual flows far more clearly than the estimated positions. (main issue is the stablilising of stockpiles in late March, discussed below; and the emerging textile manufacturing problem). 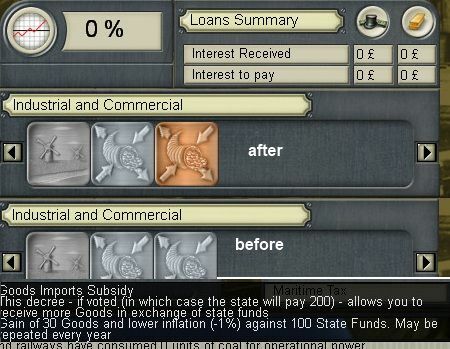 Equally I had a brief steel shortage that I solved by the 'import subsidy' option. 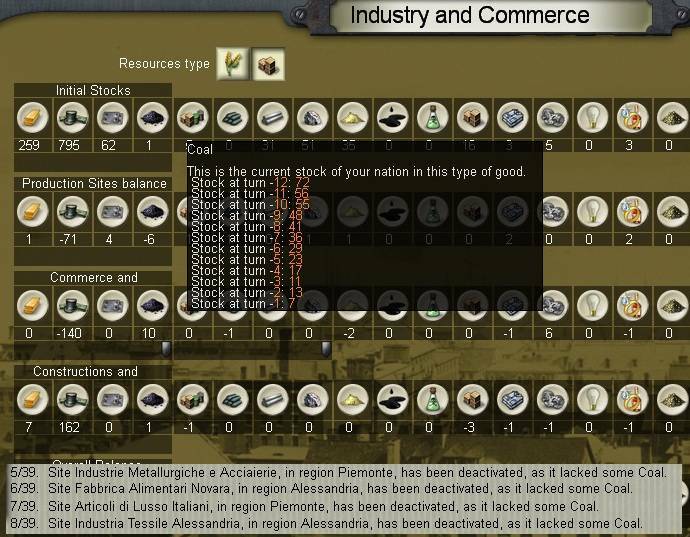 The two were related as the lack of coal had shut all my steel production down. Even so, given I am relatively cash rich, this was a neat way to boost my steel stocks. And again, typical of the minor tweaking needed, I opt to pay more to secured preserved food. Its cheap to buy and I make a lot more from the factories that rely on it. In turn, with supply improved, I start to sell more of my own goods on the open market (especially those for which there is no scope to increase domestic demand). 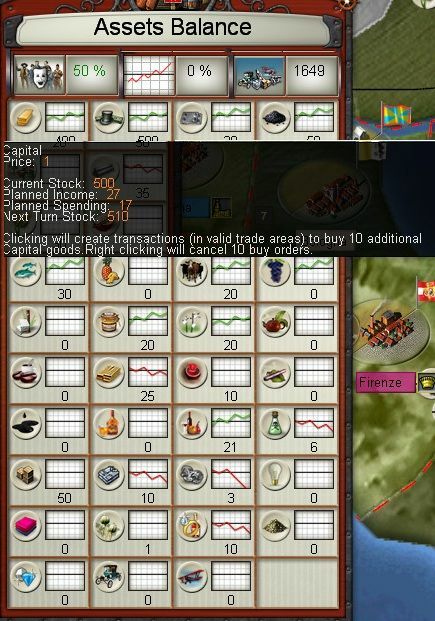 In the main I review the F4 screen for goods were the stockpile is steadily building and then try to find a level of sales that will stablilise things (some I then adjust marginally over the next few turns). This will feed back into more money to spend. As a measure of how things have changed, I'm now looking to sell excess wood rather than scrabbling around for minimal supplies. By the start of June, this is all looking rather healthy. 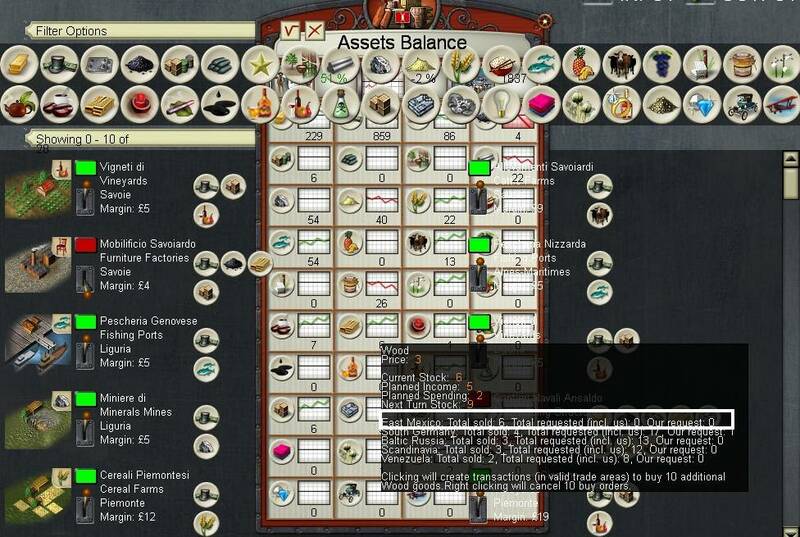 My trade is yielding a cash surplus and my domestic sales generate both taxes and happy people. 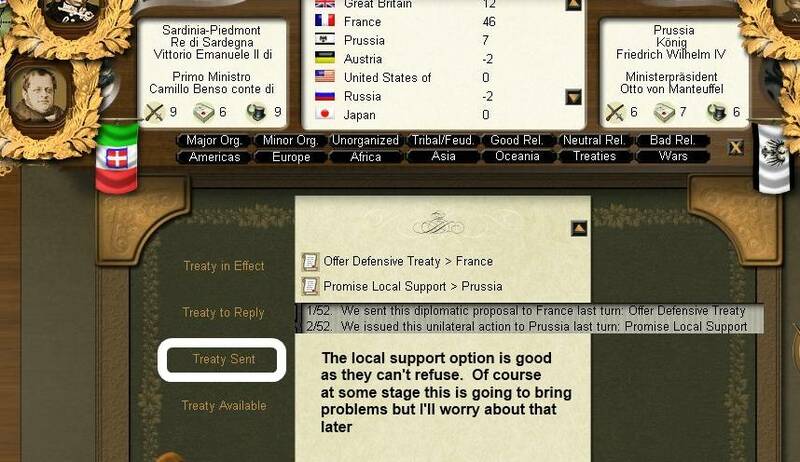 Diplomacy at the start sees me making use of the 'promise local support' option. This is good as it increases relations and cannot be refused by the recipient. I guess its the equivalent of sending a letter to the Times announcing your intentions – essentially meaningless but generates good will. I'm trying to lock Tuscany in even closer if I can. 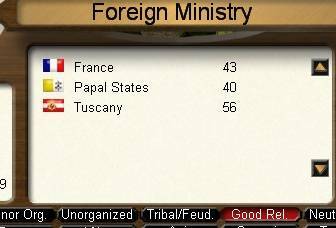 With this followed by more pressure around unification (I keep on playing these options every time they are available), with the effort concentrated for now on Tuscany and the Papal States. Happiness, improves steadily by about .25-.3 a turn due to domestic sales. Note that the actual happiness level in differing provinces varies even if on average it is increasing. So there we are. 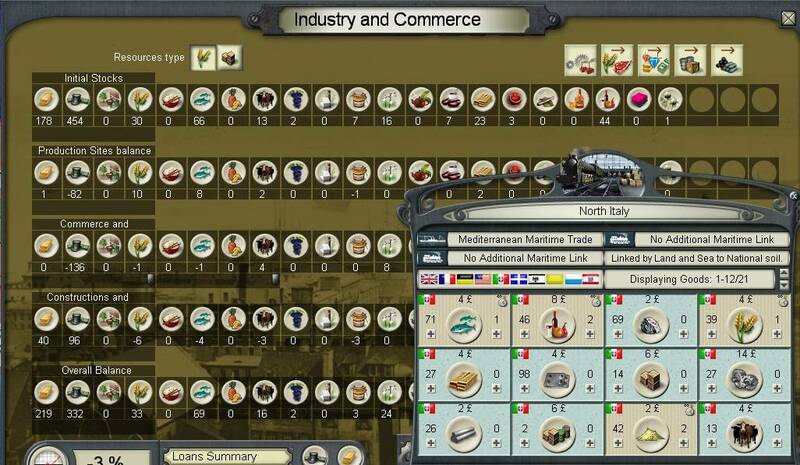 Mid-1853, the economy now looks stable with just some minor tweaks. The population is happy, missionaries are filling a variety of positions across my colonial interests. 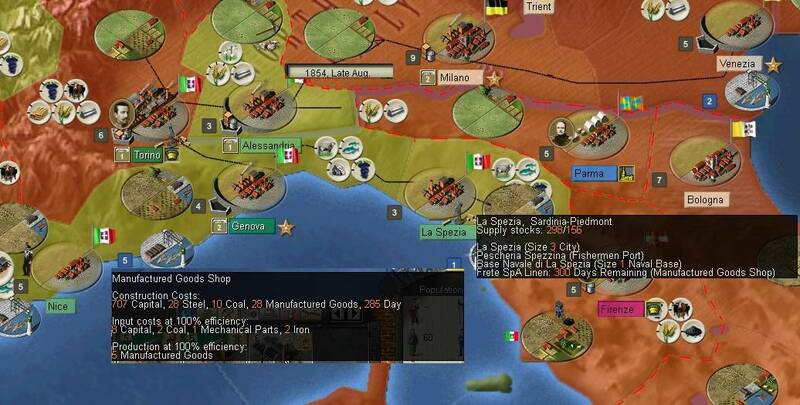 It seems as if the need now is to keep things calm, some judicious expansion of the army, slowly deveop my manufacturing base and wait for the Italian unification events to fire? Why is it that you are allowed to build a rail in La Spezia but not Nice or Chambery? The Alps? 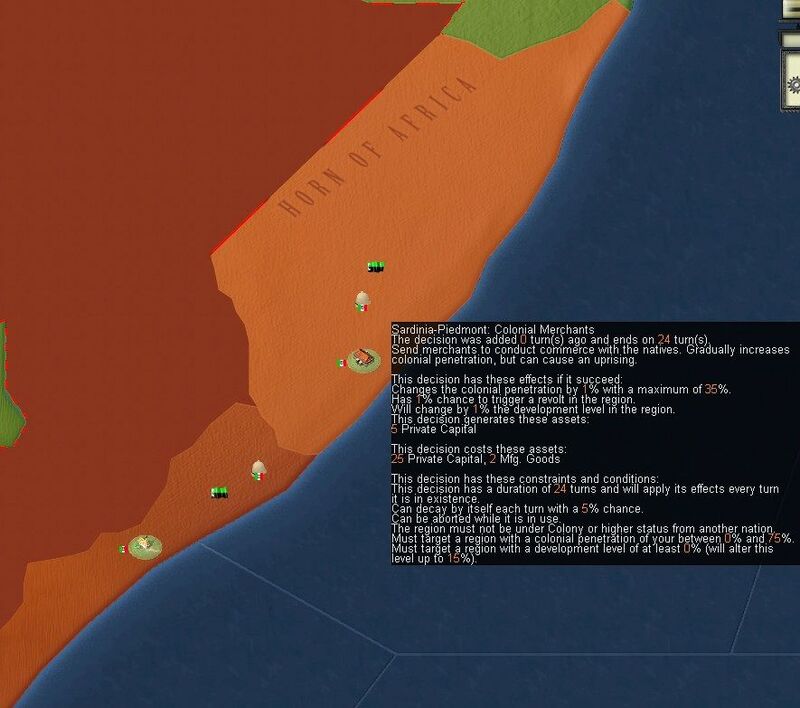 What's your colonial penetration like in Somalia and Ethiopia? Are you anywhere near taking control? aye in my slightly chaotic manner I seem to have produced a stable growing economy. I'm sure someone with a better grasp of the game could have set it up quicker but it seemed to work out well by trial and error. I could have built in Nice or Chamberry (& by early 1854 I do extend it to Nice). Its a bit like in V2, rails give you a bonus for movement and in terms of production, so best built in a productive province. In this case I expect at some time to own Tuscany, so that is a first step to a rail that runs down Italy. I'm also assuming that at some stage I'll need to give Nice & Savoy to France, if so its a waste to develop the infrastructure for them. 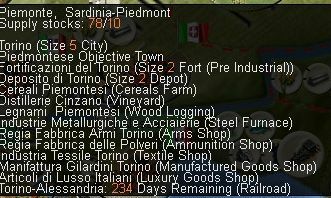 So by the end of June, the economy was stable, and I decided to slowly start adding to the industrial base of Piedmont. 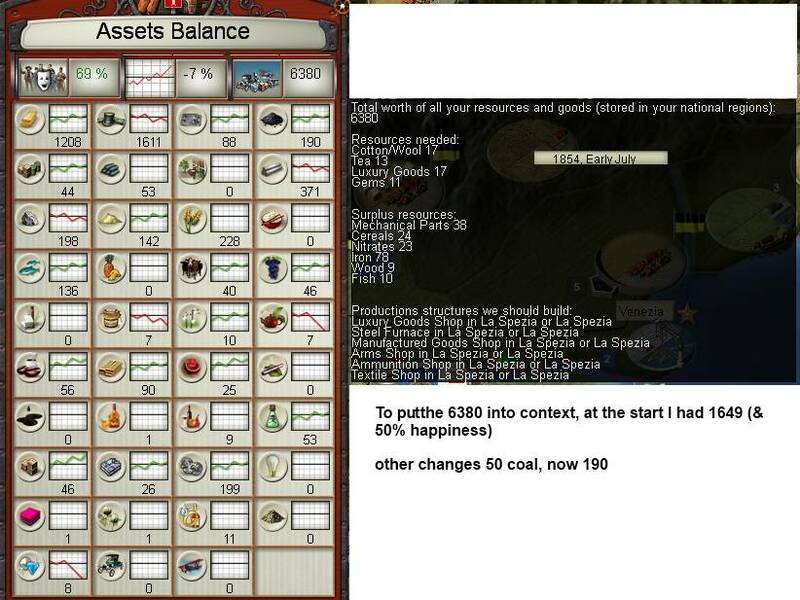 What I'm trying to do is to slowly expand my economic base, hopefully not to upset the balance I've been gradually creating over the last 2 years. and now the Pope is coming to see me .. 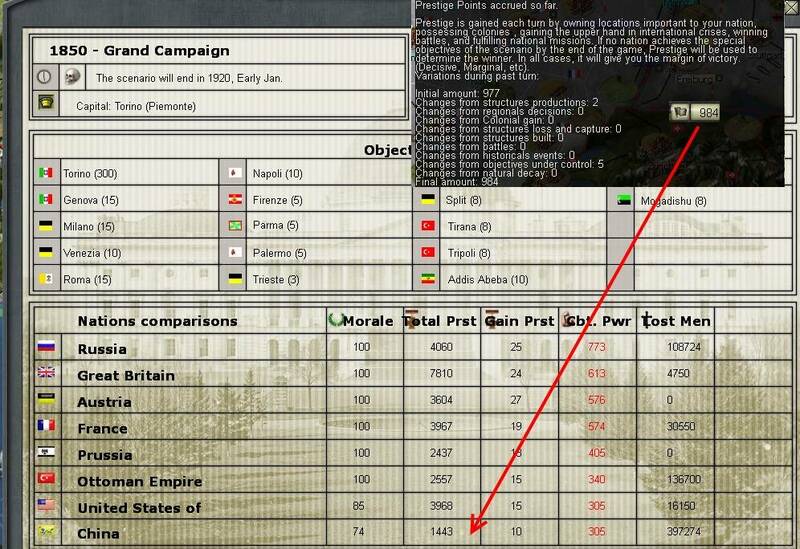 Note that in theory you win via Prestige and that different countries have different targets. Till I make progress with unification I am going to drop further behind. 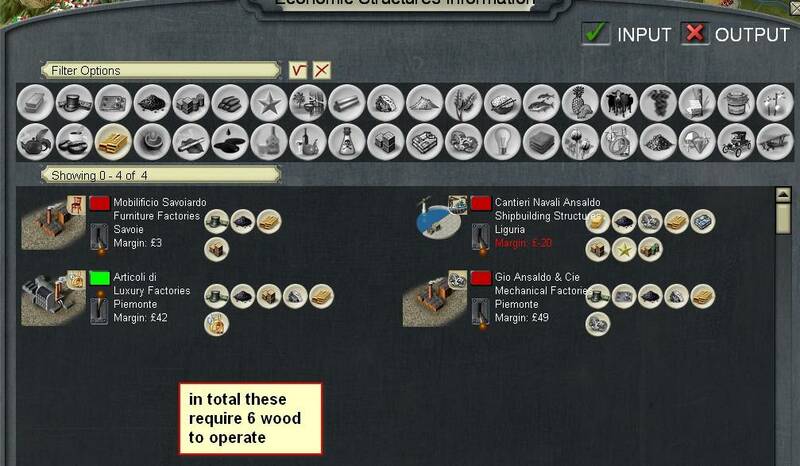 One important part to this is I can now keep my shipyards open and that generates some prestige every turn. I'll start to discuss this more in the next update but its worth bearing in mind that replacement chits in PoN are a bit different than in some other AGEOD games. In effect one chit can generate a variable number of reinforcements until it disappears (time or die-roll, I think I need to check the manual). So a single chit can cover multiple gaps. 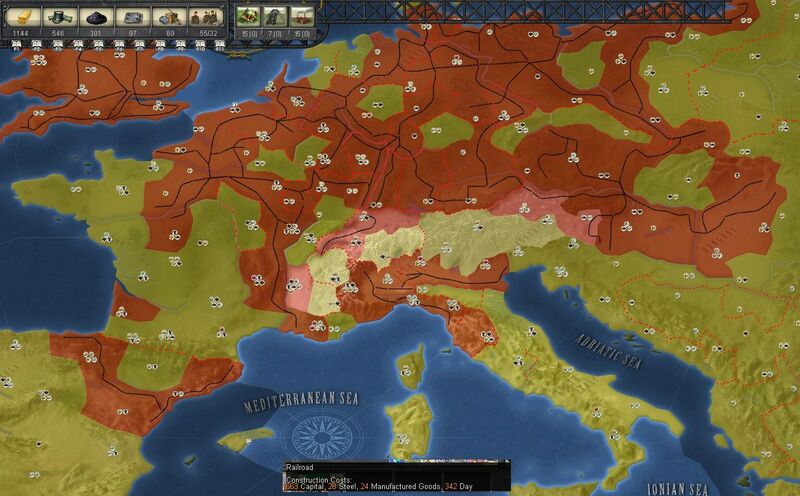 Its not that I really want to build up the army (& actually think that small and high quality is the way to go) but I don't want to find I can go to war with Austria and not have any army left. As a note I updated to the new patch early in 1854 and its gone fine (I'll note this in the next update) - edit this refers to 1.03. It does seem to have led to some small but welcome gains in turn processing speed as well. Sir Garnet wrote: Rail and River transport points allow rapid transport of troops, or supplies, as well as the econ modifier. Basic movement by rail is 1 area per day rather than at minimum several days per area, so it does matter to speed and cohesion on arrival. Where rail capacity is limited the slow and valuable troops might go by rail and the rest have to march. 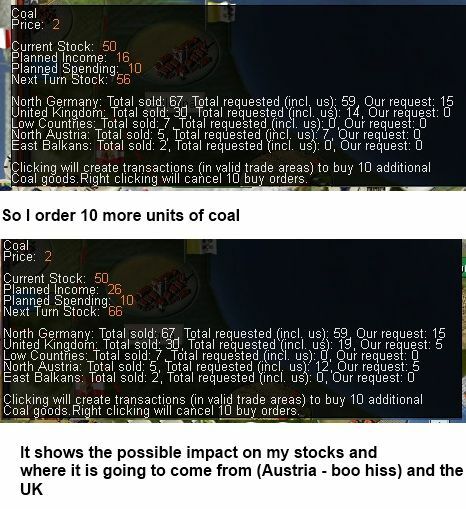 Coal costs are a reason not to spam RR unless one has a LOT of coal available, as do many European countries. Yes, at least social class is important to internal demand to buy products. All those hits could be due to lack of supply/maintenance, historical attrition setting if not sitting in depot, weapons upgrades - or some combination - even in peacetime. There is something to be said for a big army, even if hollow and brittle due to limited replacements. Something also to be said for lots of replacements (which don't require upkeep costs) accumulated to use rather than waste the flow of eligible military manpower. Setting determines whether lost entire elements can be replaced only in depot or in the field. 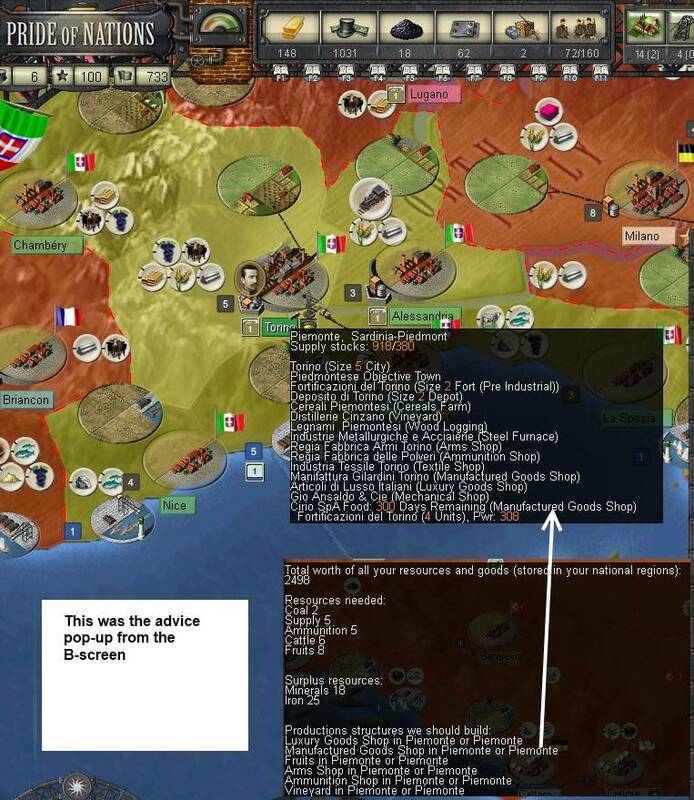 In the current multiplayer great war over Crete in the 1860s there are enormous battles in Italy with hundreds of thousands of men on a side and appalling casualties (for perspective, the whole historical 1866 Austrian army was 400,000, and the Prussians and French were both smaller than that). The result will probably decide control of northern Italy for a long time. Stuyvesant wrote: Well, aren't you the social climber? Steady, steady wins the race. Your balanced approach to improving your economy seems to be working quite nicely. 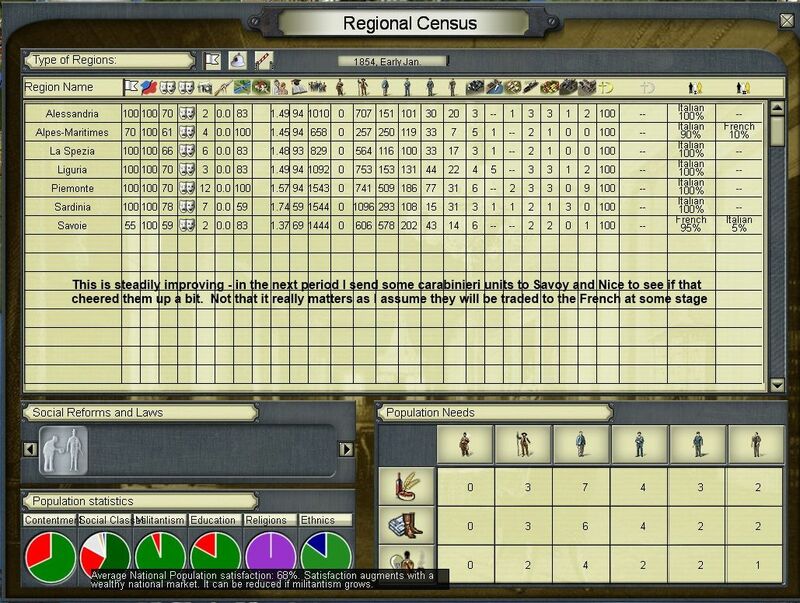 Do you have plans to lay railroads in your remaining provinces, or are the costs not worth it? 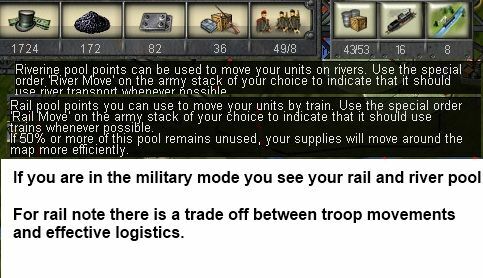 Does adding a railroad also increase troop speed, or is it purely an economic modifier? germanpeon wrote: I like the way you're expanding economically! The nitrates will cover your (dye?) manufacture inputs and the luxury goods will use up some of your excess wood production, beautiful. Are labor, employment, and unemployment factors in PoN? 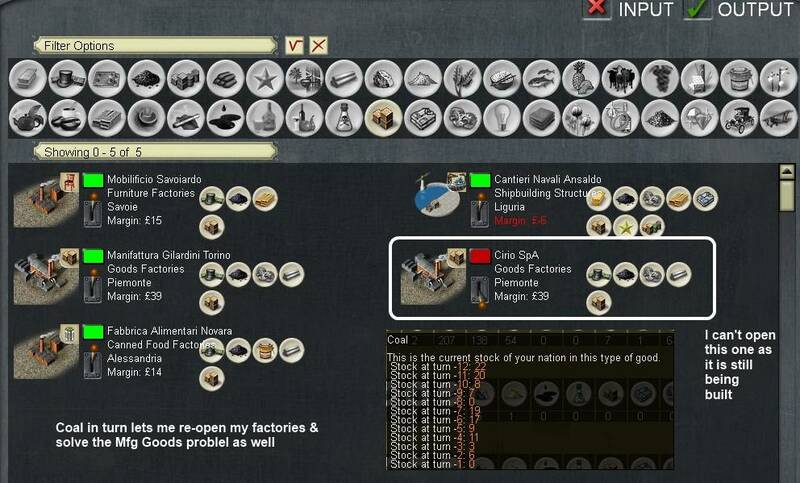 If I'm reading the replacements screen correctly, it looks like you'll need to purchase dozens to replenish your forces, which seems strange as you haven't seen any combat as far as I know. Perhaps formations start under-strength? And those dozens it appears you need come before even thinking about a replacement reserve which I'm sure you'll have. There are several attrition options in PoN. One means at peace + in depot = no losses, the one I picked (by accident as I wasn't thinking about it) means some attrition all the time (I think there is a worse one). In a way I got away with ignoring replacements for 4 years, but I do now need to pay more attention to the army. Stuyvesant wrote: Thanks for the insightful responses - I should've realized the railroad movement thing (as it's in RUS as well), I just didn't stop to think it would carry over into PON. Sir Garnet wrote: There are countries available to play, and the player group does evolve. 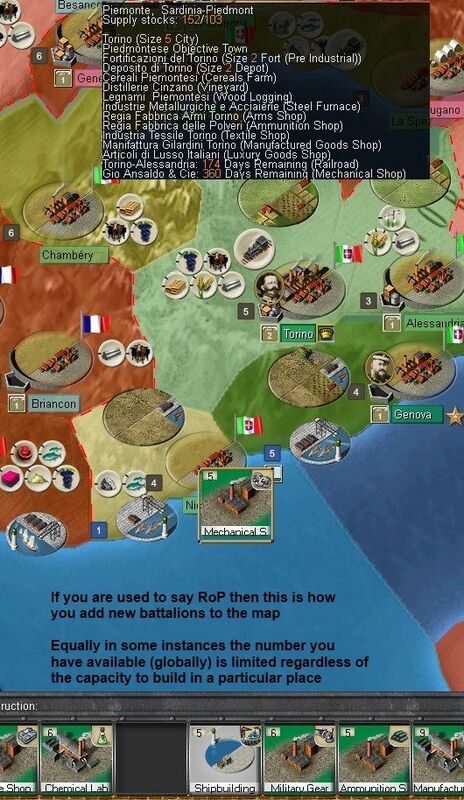 One turn every day is a long time but "Massive" multiplayer is a much deeper experience than with the AI. 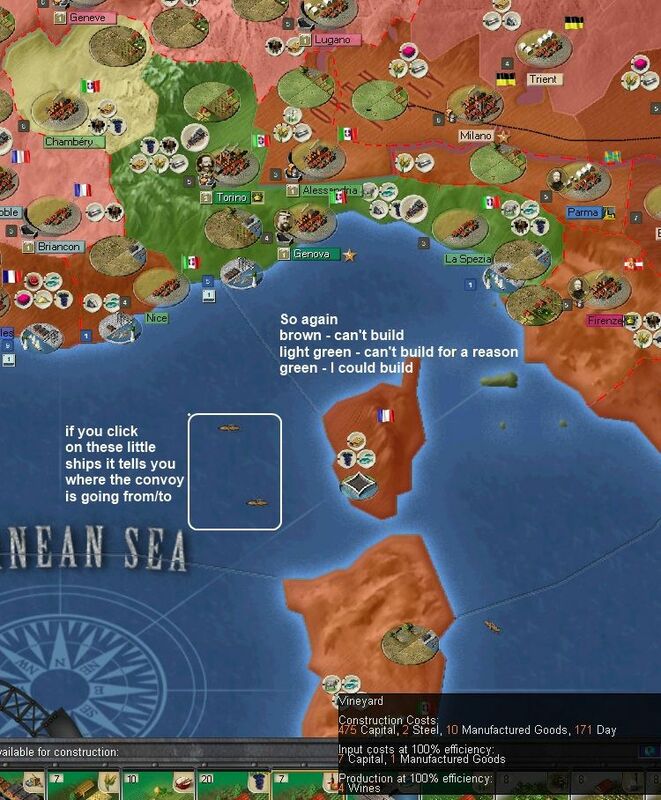 Not that I'm suggesting you stop this fine AAR and learn-to-play guide for an instant! Its like in all the AGE games, SP is good and fun, but PBEM is when they shine. 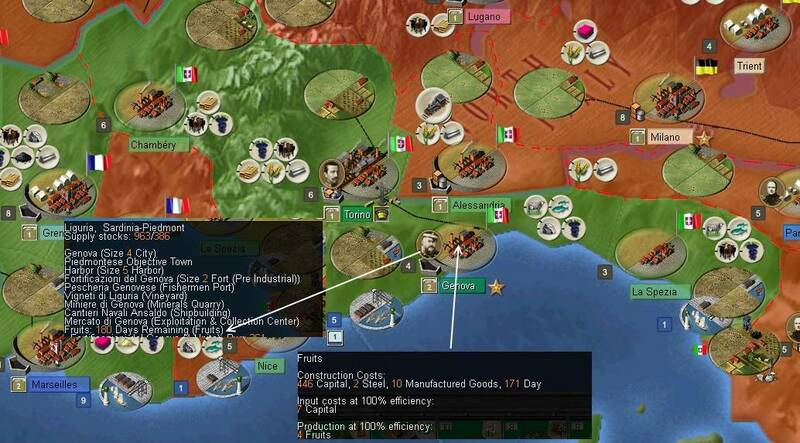 In this update, I'll cover the process of updating to patch 1.3 (painless but a few interesting things have started to happen), the usual economic reports and the start of repairing the army (as discussed briefly at the end of the last post). 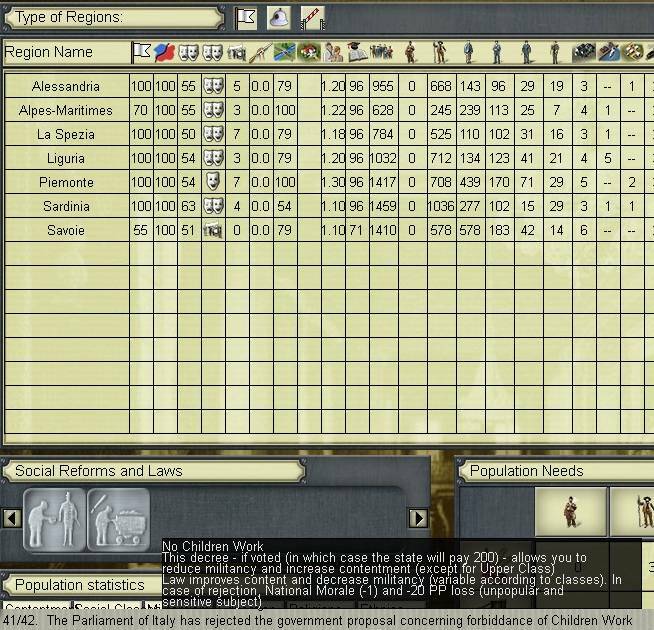 In effect I'd left the historic attrition on, so in PoN (quite realistically) even unused your army needs replacements. I guess its best thought of us as the various military idiots who manage to shoot themselves, desertion and so on. The normal inflow of recruits is handled by a different mechanism. The new patch was applied from early March onwards. 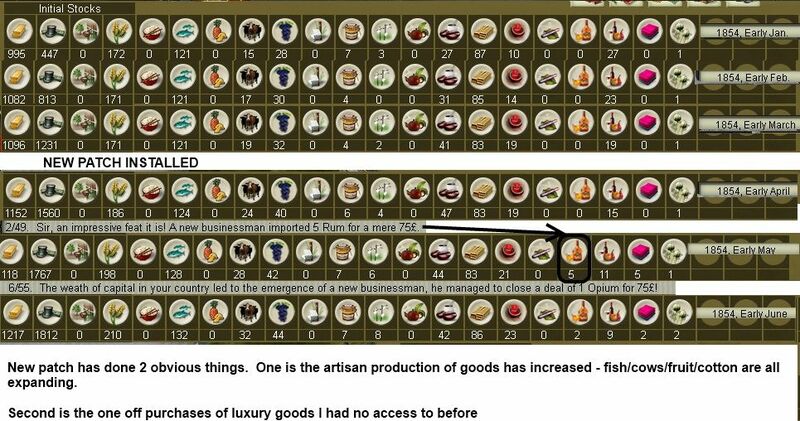 Any way, here's the usual economic data, in the main the new patch made little difference except if you look at the various luxury goods from April on you'll note that I sometimes acquire stocks. In consequence of the growth of some stockpiles, I increase my local sales of some goods and also put more up for sale on the wider market. In turn I adjust some of my purchases, but this is now pretty stable and I can pay much less attention than I was in earlier turns. New patch has done 3 things in terms of the industrial aspect. First as noted, you gain access to goods on a random basis. Second, your artisan production has improved. Third, the sequence by which operating stocks are calculated is a lot simpler. 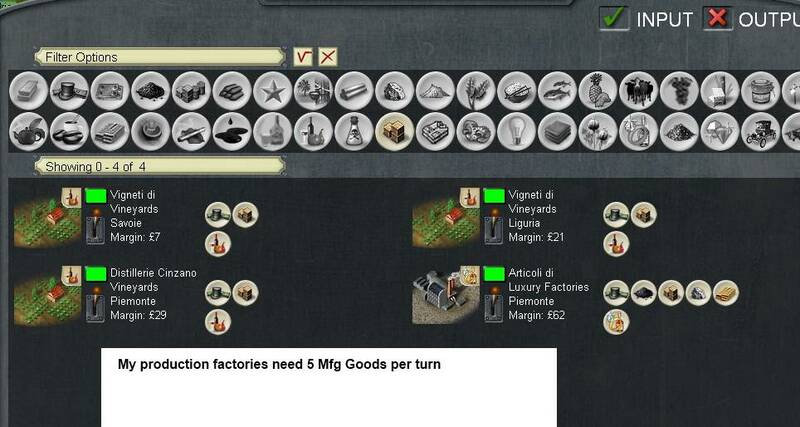 This means you no longer have factories closed due to the way the calculation is carried out, they are only closed if stuff is not available at the end of the turn. 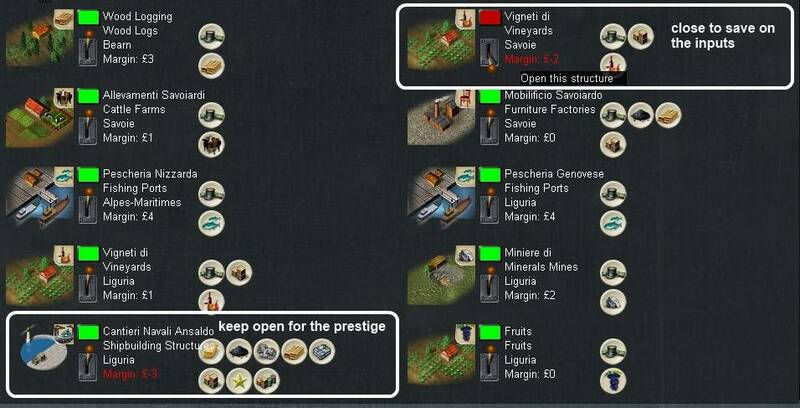 Equally, loss making factories stay open, now this is handy as I can keep my loss making shipyards open (I can sell the supplies and I gain a small bit of prestige every turn). Before the patch anything that was loss making was shut down, now you can keep it open if you have the inputs. This makes it a lot easier to maintain an economy with strategy in mind, rather than having a simple profit/loss imposed. 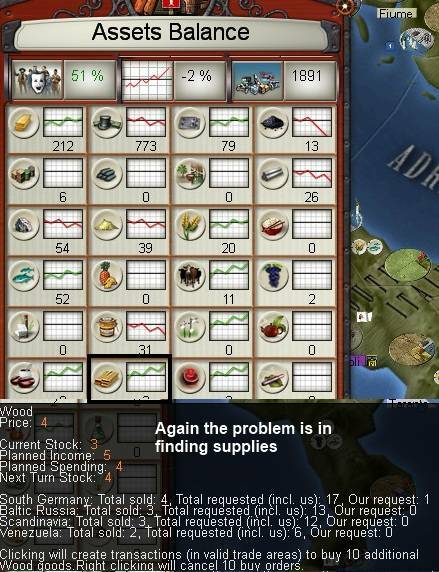 Despite some loss making, I'm building up large stocks of both state money and private capital. Not too much to report about population happiness, this is steadily improving, there are some hard to understand regional variations (such as why are the Sardinians so pleased – my new nitrate quarry?). A few missionaries here, some traders there. Its more with the goal of establishing a baseline of interest than any expectation of short term goals. France is now diplomatically where I need them for the Piombieres events of 1858 (ie the promise of support of war against Austria). The other strand is tension between Austria and France which I can't directly influence. I'm trying to edge closer to Prussia too on the grounds of the likelihood of an Austro-Prussian conflict at some stage. I carry on playing the 'support unification cards' as they occur. I believe this is only really useful if the alternative unification chain is triggered sometime in the 1860s. The main change in this period was paying attention to the army. I've neglected this (apart from the men in nice hats) and decide its time to invest. I'm playing with the attrition option that means losses even in peacetime and even in depots so I have some damage I need to repair. 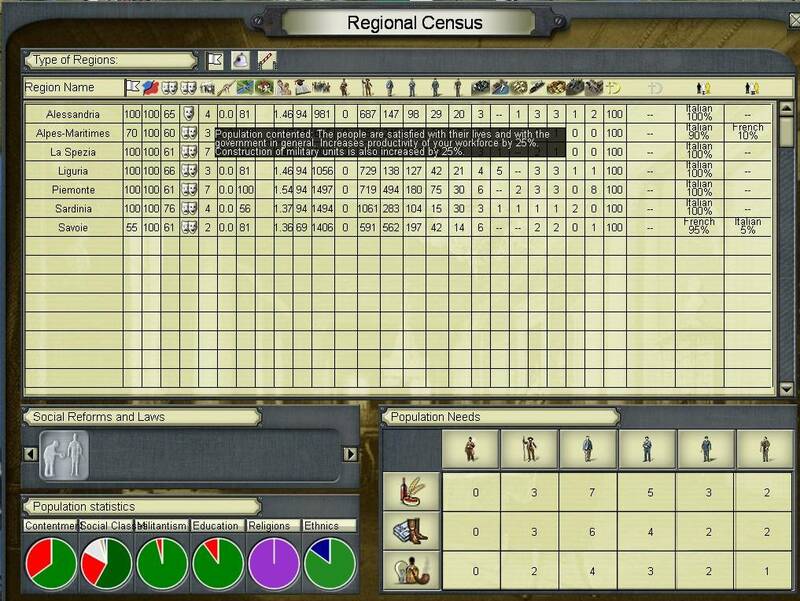 Equally, I want an army with combat power rather than numbers, so I decide its time to raise a new artillery regiment. For those of you used to other AGEOD games this is pretty standard. 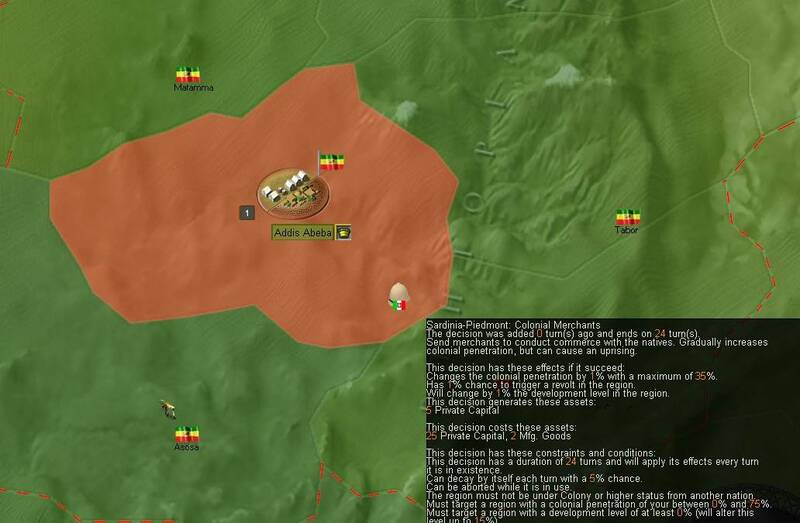 The unit deploys to the map and completes training/building on-map. It is thus very vulnerable to loss in this phase. I add it to the main army deployed at Turin for now. Now this again is typical of the AGEOD display. I've highlighted a cavalry division and on the right you can see the component regiments. The red are damaged elements (attrition) so I do need to start paying attention to the issue of replacements or I'll have no army to fight the Austrians. Powloon wrote: Seems like another 6 months of solid growth. One thing that I noticed is you need to be careful about emptying your conscript pool. 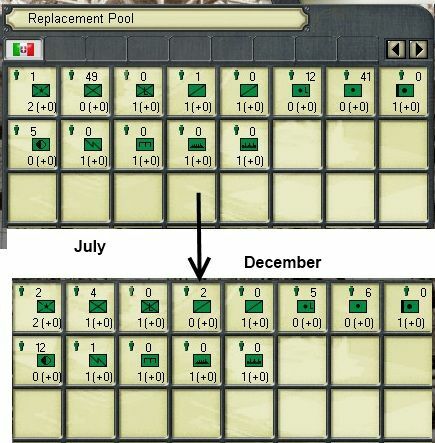 I did something similar to you and noticed I needed replacements and emptied the pool but you need a minimum of around 3 conscripts to maintain your army. Next turn I got a message saying i could not maintain my army ( had plenty of money and manufactured goods ) and suffered extra hits ( I think the game checks your conscript pool at the beginning of the game turn before new conscripts are added ) thus wasting some of the new replacements I bought. 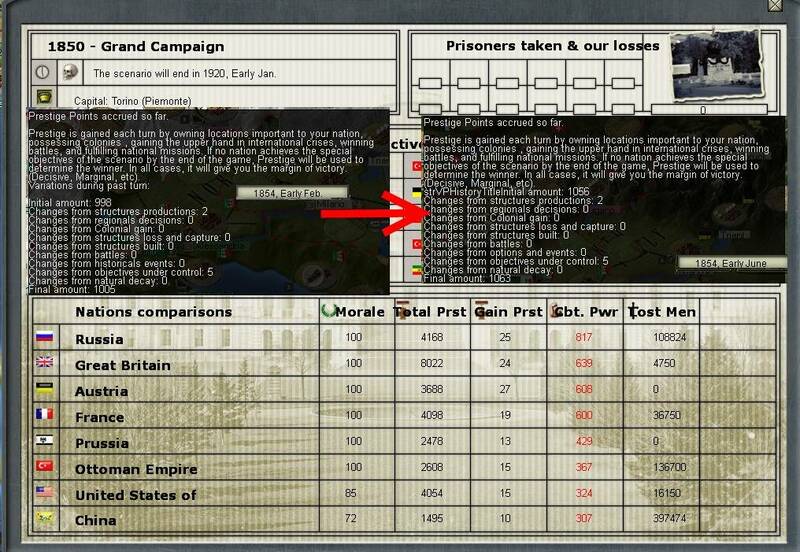 You might want to also start looking at upgrading your fortifications from pre industrial as it seems to be relatively cheap (although each upgrade takes about a year to complete ) Might give your small professional army that extra boost facing the Austrian hordes! 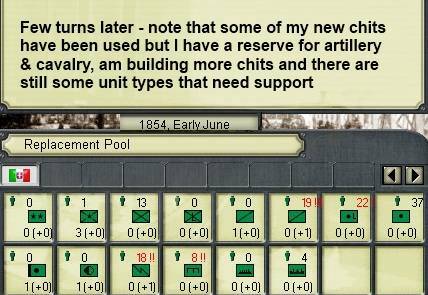 I made that mistake in one turn and had 19 hits, so since then have been very careful to leave enough replacements to cover the basic churn in the army. I've been thinking about fortifications in Alessandria and decided not. 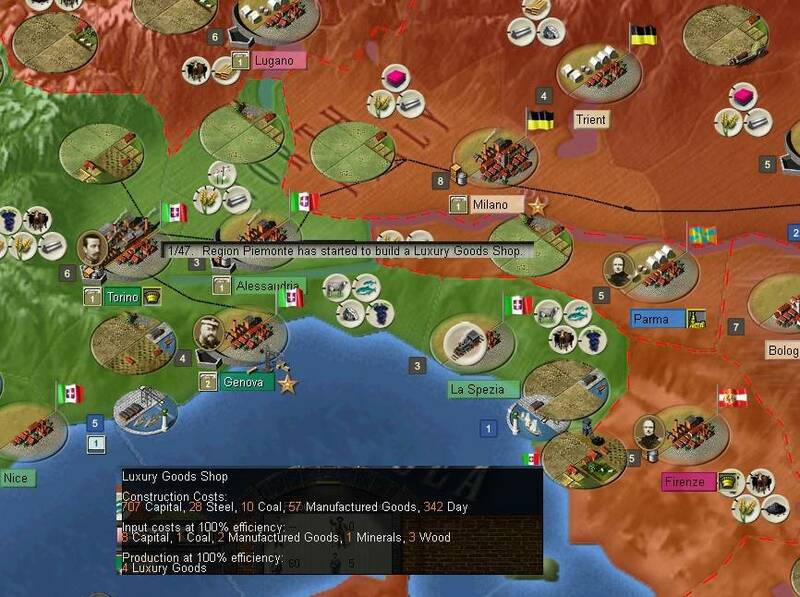 My logic is if I have to fight Austria on my own, I can't see that really helping me, if as I hope, I have French backing then I should be able to reach at least Milan before the Austrians react, so the war should be in Lombardy-Veneto not Piedmont. Time will tell if I'm right about this. Stuyvesant wrote: You're starting to build up your army - will you have enough time to field a reasonable army come 1858 (or thereabouts)? 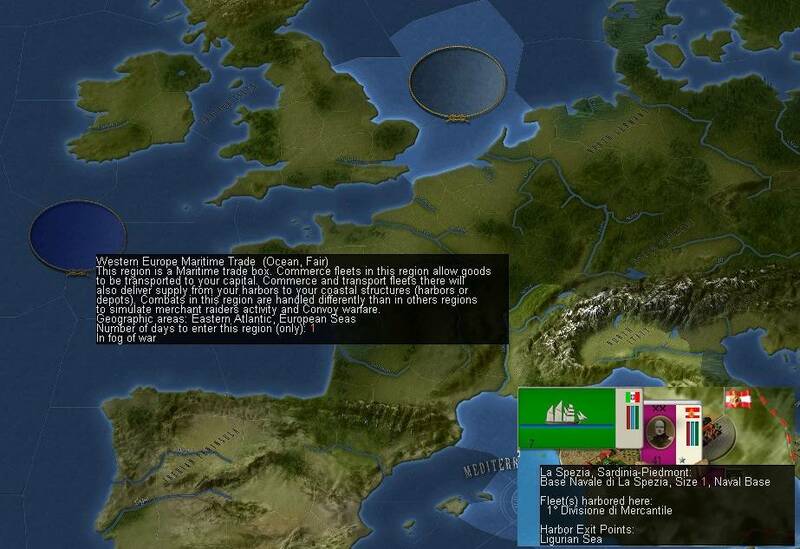 Again nothing too radical happened here, but I carry on repairing my army and building up the economy. Diplomatically I carry on rather exploiting the 'promise local support' option (since it can't be refused and I'm not too worried at ever being asked to honour it). So I send this to Prussia & the Italian States when I can. 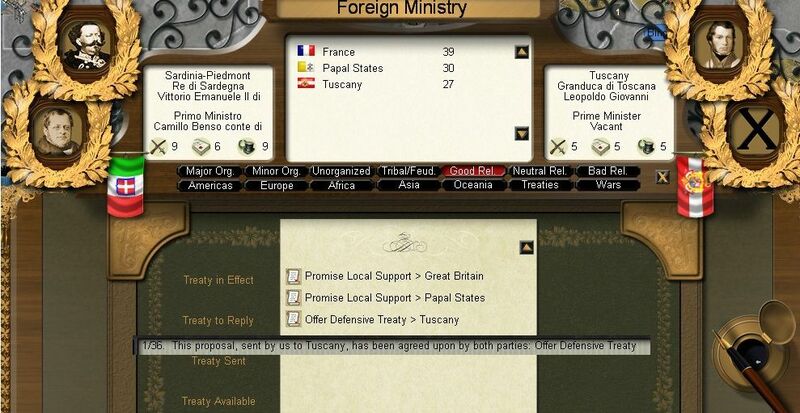 I also have a couple of messages that Tuscany and the Pope want to unify but this seems to be just advisory that I met some of the conditions (if I understand correctly, if the Piombieres/1859 war chain doesn't fire a separate event chain kicks in during the 1860s in any case). As ever, I carry on fiddling with the buy/sell screens every now and then to keep this in balance but I'm actually more or less able to ignore the economy for the moment. At the end of November, my luxury goods factory opens – just look at the money – and I opt to sell a lot of this new production domestically. I carry on calling up replacements to cover the gaps in the army reserve, and by the end of 1854, my only gap is with regular infantry. I'll try over the next 3 years to boost my replacements so I can easily cope with combat losses. Sir Garnet wrote: Piedmont is really booming. However, are you fully satisfying your internal market demand? You look short of luxury items, some gaps in your merchandise selections, and large stockpiles of that create a surplus going to wastage at high levels. Sometimes shutting down a facility to use the capital elsewhere is wise. With all that fish preserving food at times and setting up some canned food factories seems in order. I'd suggest using up those stocks of raw materials in factories before opening more mines. They are fully satisfied for all but the luxury goods, which is part the reason my stockpiles are growing. 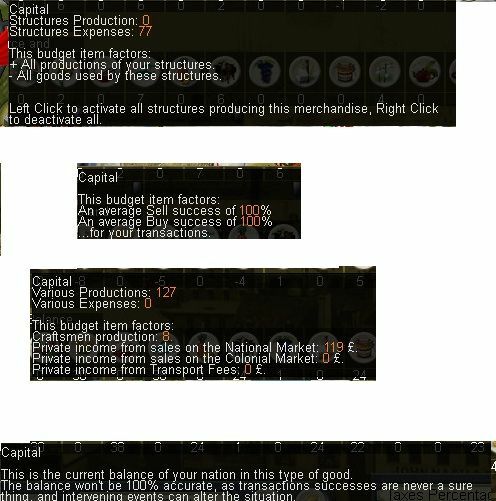 The only ready supply of luxury goods is my new factory and the random stuff my merchants seem to bring in since the new patch. But in the next period I took your advice over some judicious closing of loss making enterprises (seems so ... well so Thatcherite ...). My next plant is a steel works, but I'll do a canned food one afterwards so thanks for that advice. 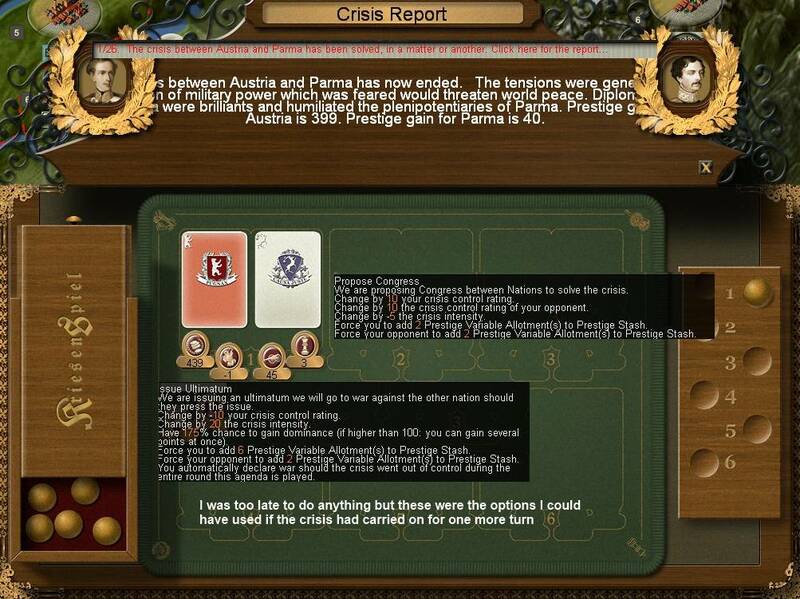 hgilmer wrote: I don't know that Prussia will fight Austria at some point, but in my game as Prussia, it seemed that at some point I was "supposed" to? Maybe. 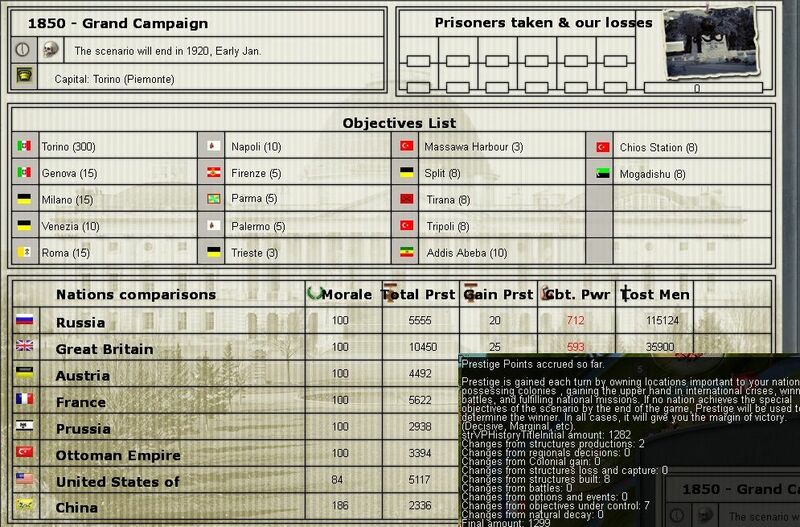 Anyway, I did fight Austria in the 1860s and I won, but I got no real war gains. But, it was still from the victor position. 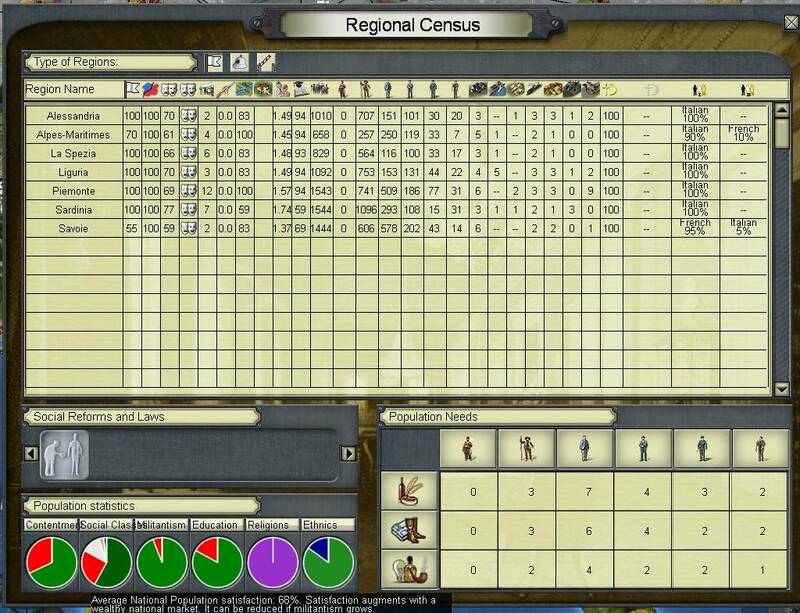 I'm still just learning, and it seems like their armies completely disarmed, because they were not in the top lists of army power for some time and I did not destroy their armies. Stuyvesant wrote: Am I connecting the right dots to see the construction of the new steel mill and manufactured goods plant causing your state capital reserves nosediving for a while? And what's up with the steady decline in (I believe) coffee stocks? Have the Italians discovered Espresso a little too early? Nice move to send in the Carabinieri - that'll teach those coffee-swilling layabouts! Yes, the big dips are usually where I've built something - I'll start annotating those tables so its a bit clearer and should identify one off gains/losses from the more underlying trends. Definitely finding the same as you in my campaign these early years as SP are definitely very quiet and I am almost itching for war. No doubt I'll have to eat those words when the Austrian horde comes swarming over my border. Exactly my frame of mind. 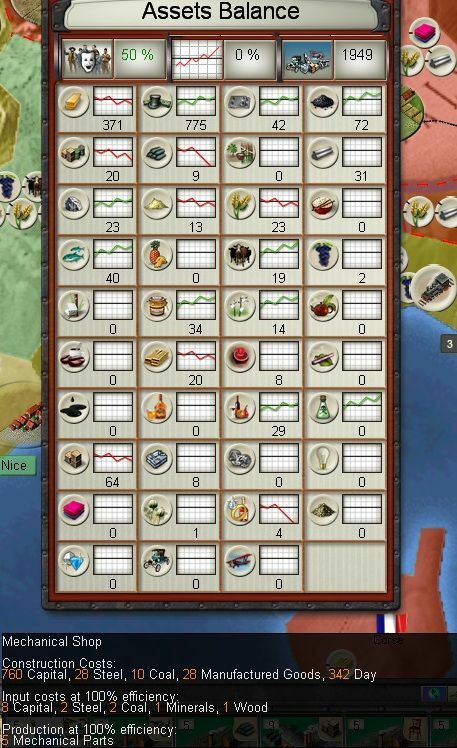 In part I'm rather enjoying building up an economy and fiddling around. 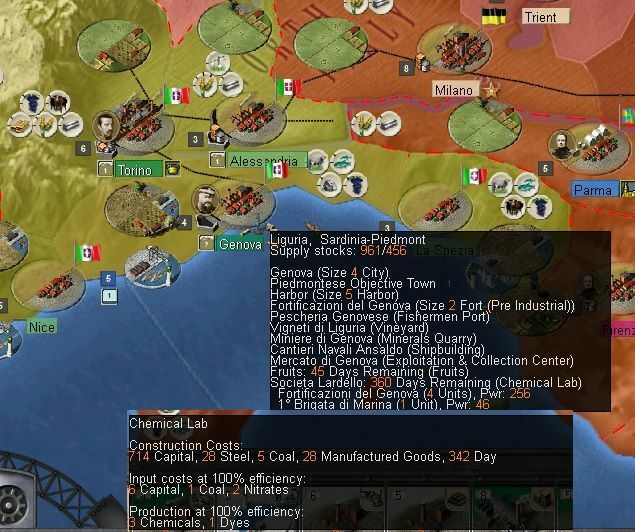 But I do want to get on to the main events ... but don't want to see all my nicely built factories and farms burnt down. I'll think about the forts, its just at the moment I don't see them helping. 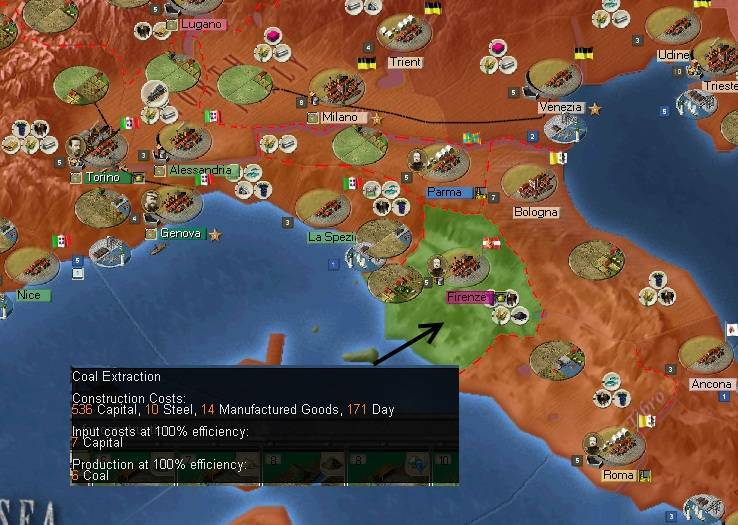 If I had Italy unified then I will build some in key northern provinces because in theory I could manouver around behind that screen, at the moment I have nowhere to go (well I could retreat into France but that is all). I'm also a little tight for capital, so would rather it all went on industrial development for the moment. I guess I have 4-6 game years in which to learn if I've made the right choice. Director wrote: Looks like you are making all the right moves. Of course the curse of most minor powers applies to S-P: your destiny is only somewhat in your own hands, dependent on events in France, Austria and Prussia. I don't think you are able to take on France or Austria without major assistance. Still, if luck is mostly preparation and a willingness to sieze the moment, you will have done what you can. Should the 'historical' wars between Austria and France, and Austria and Prussia, not happen or be delayed, then you may have to rethink. 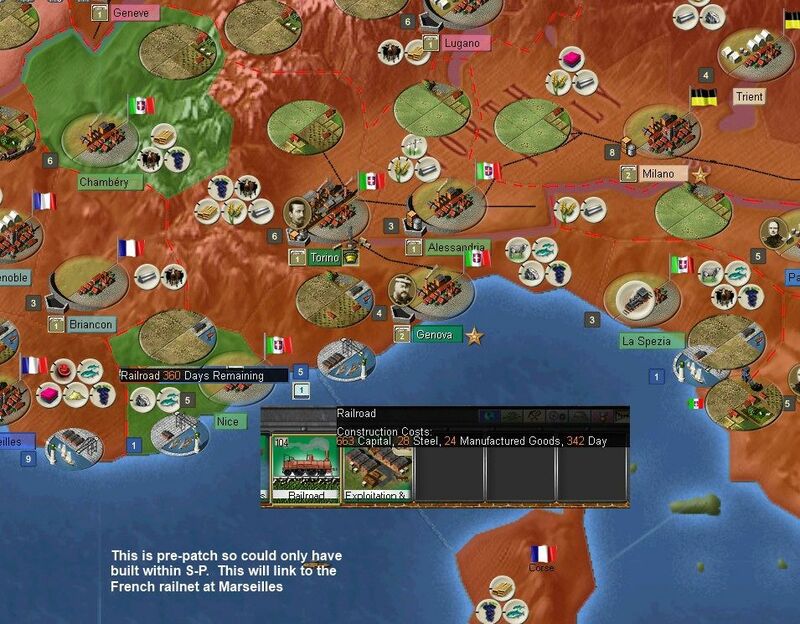 I think if those wars don't happen PoN has an ahistorical event chain for the mid-1860s that will give me all of Italy outside the Austrian provinces (which is the reason why I'm investing a fair bit on diplomacy within Italy). I guess then its a case of finding the best route to being able to challenge Austria - either opportunistically or to first build a colonial power base (in which case the Ottomans may become my preferred target as I have the equivalent of 'cores' on a lot of their land). But yes, this is a classic deployment of the old military maxim about "hurrying up and then waiting", all I can do is create the circumstances where if an opportunity does come up I am able to capitilise on it. So, we enter 1855, this means I have played 96 turns (to the end of 1854) and am only 20% of the way to my notional end date of 1870 ... best not to think of that. In truth more of the same, slow industrial development, fiddling with the trade screens, shutting down a few loss making farms (to direct capital to new builds) and the process of building up the army reserves. 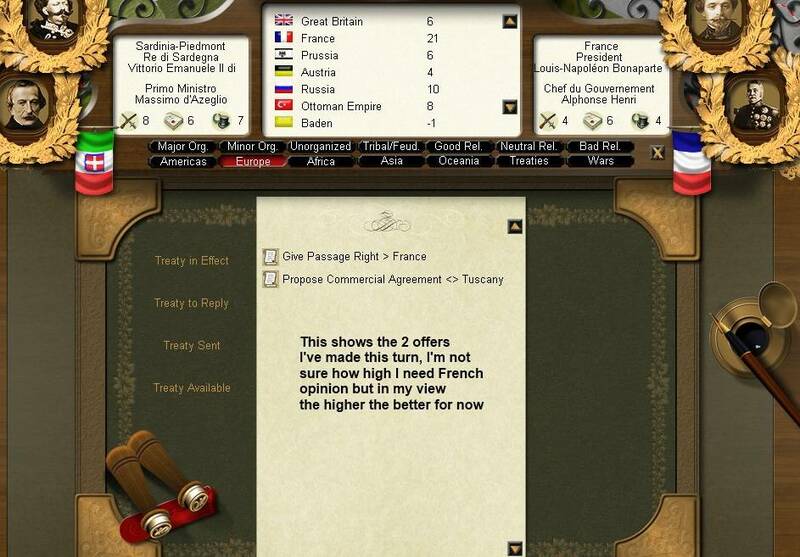 And of course, smooching the French and a more formal approach to being nice to the UK and Prussia. 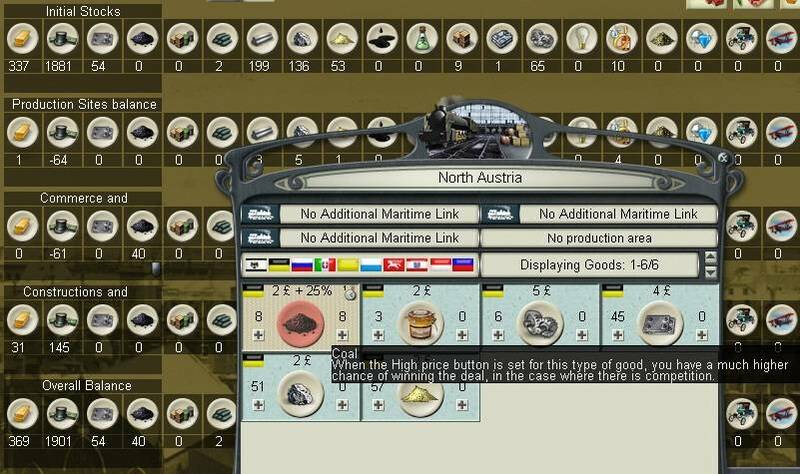 On to the detail with the usual industry screens. I don't know about anyone else but I find putting these together incredibly useful, first thing I do in a new 6 month period is a lot of minor adjustments using these trends. Replacement situation across the period (just the start and end numbers). 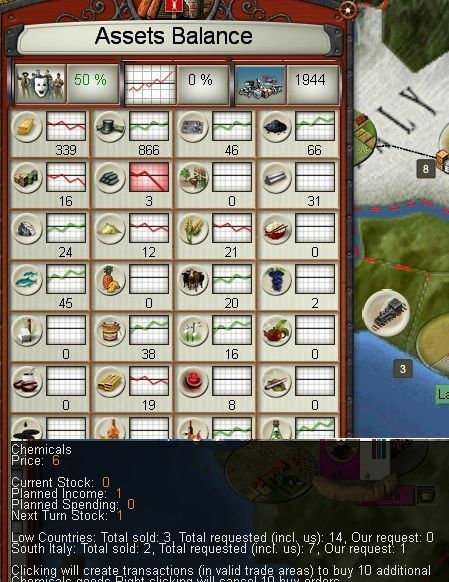 I'm slowly trying to build up a stockpile in most types and will build some more artillery in the next couple of years (combat power for little manpower cost). but it appears the Americans are pressing into Mexico. Although, they seem to have an emerging domestic problem. I would be interested to see how you are organising your army. Obviously you are concentrating on replacements to give your army some staying power which seems eminently sensible to me. Do you have a way of determining how many replacements per category you need? From your experience how many artillery units is optimal for one force? Is it the case of the more the merrier or do frontage rules mean there is a theoretical maximum number of artillery elements per force that are effective? Apologies for all the questions but this is just what I have started to make decisions on in my game. For my part I have 2 armies led by the 3* generals one with the guard corps and cavalry division and the other with the infantry corps and the light cavalry brigade (each corps is led by a 3* officer and the cavalry division is led by a 2*). 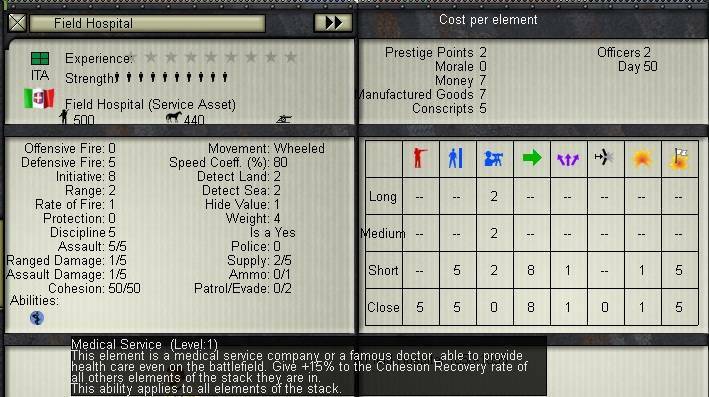 My plan (such as it is) has been to provide each force with cheap support units ie Field hospitals, engineers, pioneers etc to multiply their effectiveness. To this end i have also split the starting supply wagons to each force to get the 10% firepower modifier. 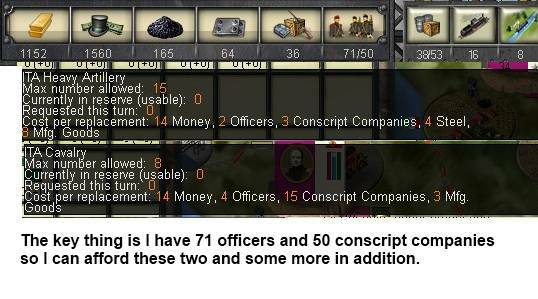 My next task is to add artillery which is relatively cheap in terms of conscripts to give a each army a force mutiplier. If time and money allow I will also replace the light cavalry brigade with a cavalry division. This is more of a finger in the air set up not having got very far into this game yet. My thinking is to use 2 mutually supporting armies in adjacent provinces to try and catch smaller enemy forces hopefully with one army riding to the sound of the guns of the other. Again from the games you have played is it better to have mutually suporting forces or scrub that and go for the single stack of doom approach? One final word on the fortifications is they use state funds (which you seem to have a rather large stock of) rather than private capital to build so in theory building them shouldn't impact on your industrial build up (other than maybe competing demands on your manufactured goods). My experience of actual combat in PoN is limited to the scenarios so this is a bit generic, but its the logic I'm using. As you prob know, most AGEOD games have the 'march to the sound of the guns' rule. In effect corps in adjacent provinces that are organised in the same army and (& this is critical) have the same stance (defend-attack etc) have a chance to react to battle and arrive after the 1st hour. That means you can spread out, constrict movement for your opponent, envelop and so on. My second RoP (Mightiest Empires) uses this tactic a lot and has towards the end a salutary example of what happens if it goes wrong (in that case, I got the stances wrong and an entire corps was slaughtered). Equally, esp with generals with low activation its not foolproof, they can just sit there while the other corps is left to fend for itself. So on balance spread out is better but make sure of the command structure and be aware it can go very wrong. 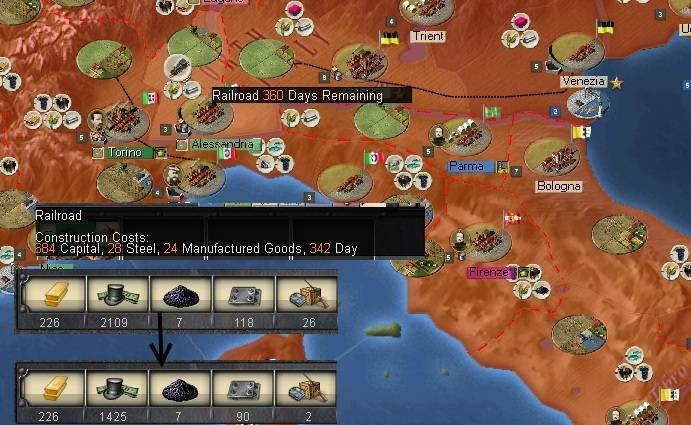 For the war with Austria, if they have no army already in N Italy, what I will do is to split off the cavalry division, send it forward with attack-evade orders (this will take military control but hopefully opt out of fighting). If Parma and the Pope are neutral (or haven't given the Austrians passage), I'd keep the rest together, overrun Milan and Venice and then think about where the front lies. 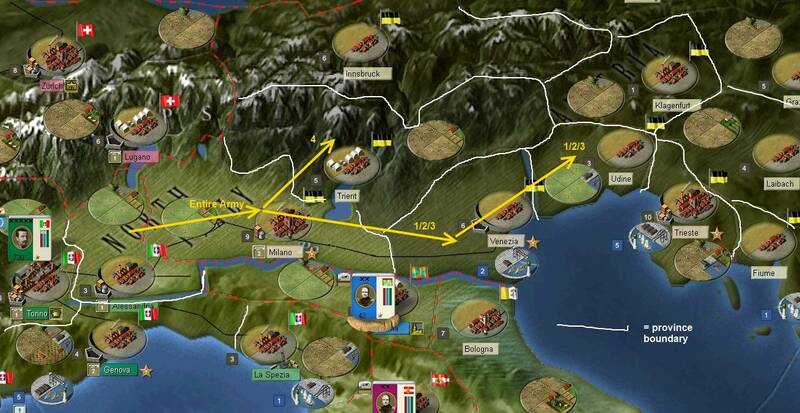 At that stage I will probably split into two stacks to push into Udine and Trieste and try to hold that line till they give up. 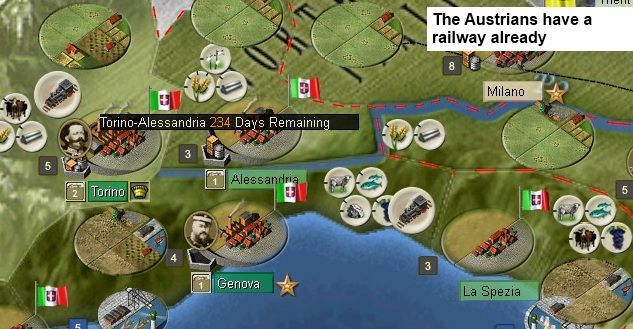 If the Austrians are already in force, I'll defend (at all costs) in Alessandria, let them take the org losses for movement and I'll have the entrenchment bonus. Hopefully the French will arrive soon enough to rescue me. 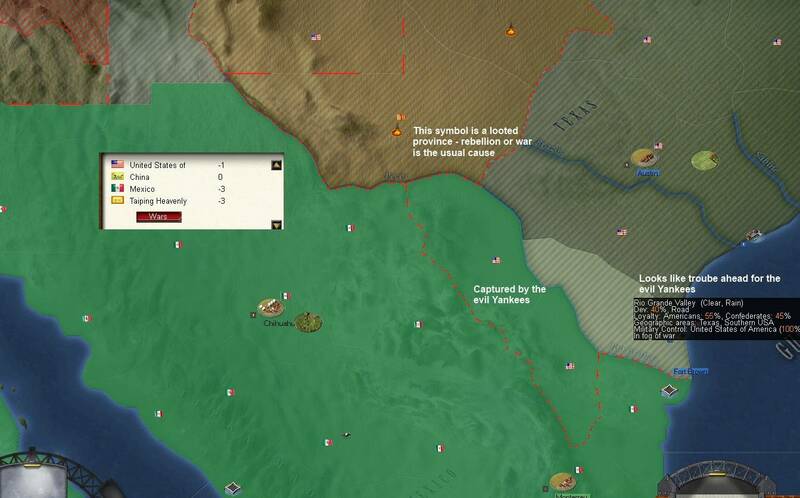 In the scenario they start on the border, but I'm not sure of their deployment/response in the GC. Stuyvesant wrote: Even the best of friends (such as the perfidious French) can have disagreements sometimes. Of course the French have no business in Italy's backyard (never mind that Italy doesn't exist yet), but oh well, live and let live. Or rather, let live for now and hope they die in massive numbers for your cause in the Piemontese-Austrian War to come. I imagine that shutting down those factories must've been hard on your sensibilities. Just know you're doing it for the Greater Good, which justifies any means necessary. You're 96 turns in... That's about 94 more than I've ever managed. 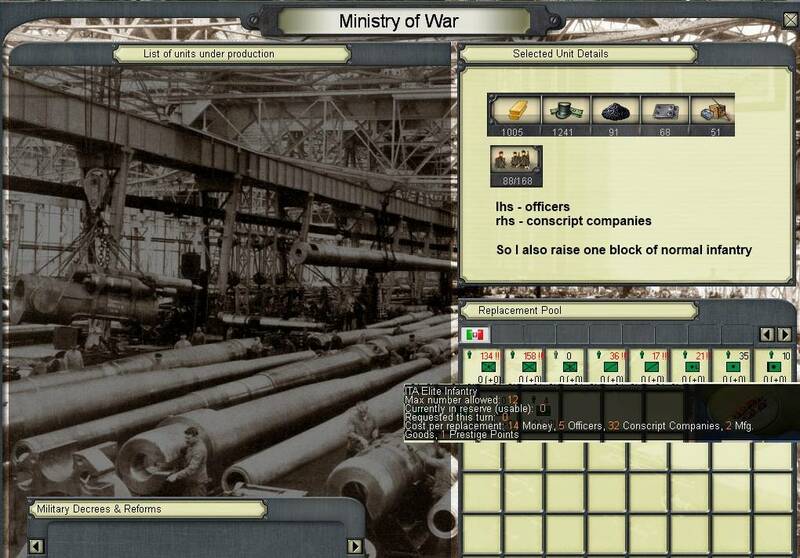 Sir Garnet wrote: SHUTDOWN: Shutting down and opening structures is fairly regular for me as Brazil in multiplayer. For example, the mechanical parts factory only needs to run half the time to meet demand since there is a negligible international demand for them now though they were in short supply once and are strategic enough to have a domestic factory. Mfg Goods are needed to make Wine and Rum. Whether that is profitable or a loss, or huge loss, depends on the relative input and output prices. Sometimes it is a much better deal to put the factories on holiday and import something. Luxury factories can also get upside down but not as badly. And of course if your warehouses are bulging, it won't sell, and is going into wastage, it may be wise to stop making more. MARCHING TO THE SOUND OF THE GUNS take a more flexible posture in PON - you just can't be in Passive and Defensive is a negative modifier. 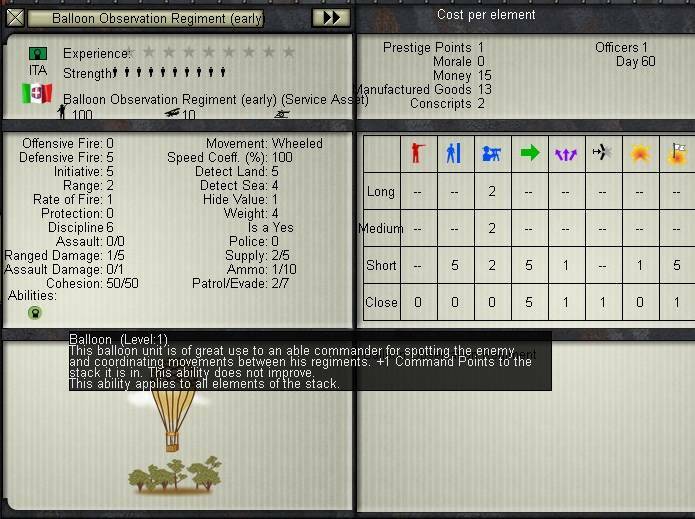 Check the details in the section by that name in the Combat in the Field chapter and you can estimate the odds of a response based on factors including days distance, strategic rating, enemy MC etc. However, synchronized movement (which applies only to forces in the same region) is the easier way to coordinate forces on the move - a valuable feature indeed. This means each force (stack) can be appropriately organized but they all move in concert. Some commanders have good skills but low strategic rating so tend to be inert when in command of a force, but they can serve well when attached (the + command) to a Division or Corps operating within the force of a better commander since their abilities and ratings apply to help their own unit when directly attached and some may also benefit the entire force. Also note that four 2**s have the same cumulative 48 base command points as a 3*** with 48 - in both cases before bonuses that can sometimes go to +5 or more. That defines the optimum stacking size in terms of command penalties. FORTESSES: Very useful. Best staffed with fortress or garrison units and fortress artillery if available, which can be reinforced by field army troops if needed (who can also sortie if the enemy besieges too lightly. Other than running out of supplies, artillery is the biggest factor in deciding sieges. COMBINED ARMS: A decent 2** can command a Corps unit and a few extra points, which allows a 2 CmdPt cavalry brigade in an independent force for its scouting, pursuit and other capabilities as well as extra artillery and other support troops to provide a boost. A 3*** can command a real army, which if operating on its own should include no more than 3 Corps units to allow other useful assets that cost CmdPts and may be valuable in detached service for which a corps would be too slow, overkill, or too much to risk. A nation like SP with a lot of wealth and industry relative to manpower might also attach artillery regiments to divisions or even infantry brigades operating independently such as temporarily guarding towns or forts. Artillery matters a lot in the ranged phases of combat and also works to conserve manpower. 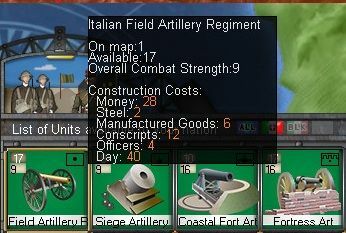 thanks for that, I think I'll add some artillery to Alessandria (it can always redeploy later on). Good to know that the stances aren't so literally applied around march to the sound of the guns - that can really catch you out in RoP (& NCP). I've got more committed to shutting stuff off and then back on for a few turns. Esp if its easily available on the world market. 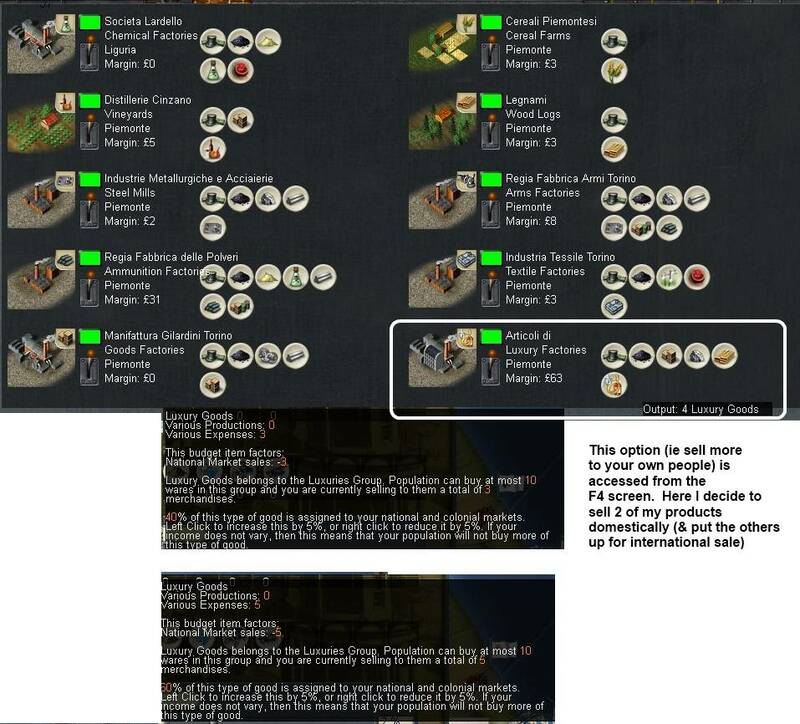 At the moment in my game, apart from the really rare/expensive stuff there is far more available for sale than buyers. I guess that will change as the next generation of industrial techs etc come into play (in my case I guess about 1860 at current rates of progress). And a useful reminder to pay attention to the more specialist elements. I remember from RUS that some of the more exotic support units can be very useful. Ok, this update will be the usual reports on shifts in the economy, population and so on. I'll try and integrate these reports a bit more so you can see how things interact. 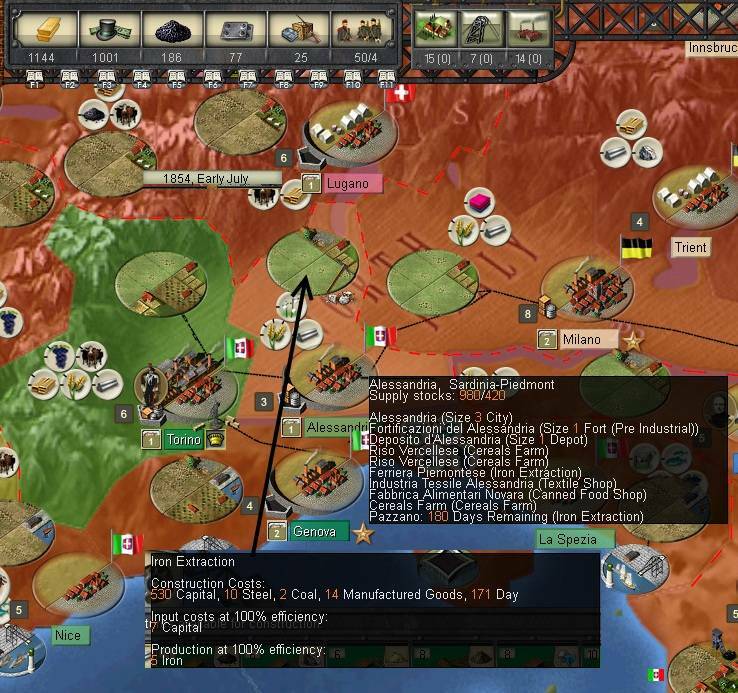 I also will turn a lot of attention to the army (which I am improving by adding all sorts of specialist units) and some guesses as to strategy in a war in the Po valley. This shows the changes in replacements across the period. I'm slowly starting to build up a decent reserve. The main issue here was they were content enough but militancy was rising. So over the next 6 months I passed several decrees that halved this (each cost me a fair chunk of state funds and I have no enacted all the cheaper ones). Seems the only really grumpy ones are the inhabitants of Torino. Colonial activity continues to emulate an arthritic snail. But I do get a few cotton shipments so it has some payback. Here's the main relations with the major powers and those that really like me. I start closing stuff down and opening it on need. But this shows the difference when you have rails built. Savoy and Sardinia are my only non-developed provinces in this respect and you can see the difference in terms of output between the two. At the end of the period I decide to invest in another luxury goods factory. This is the one item I can sell more domestically (=happiness+state funds) and it fetches a good price on the world market. 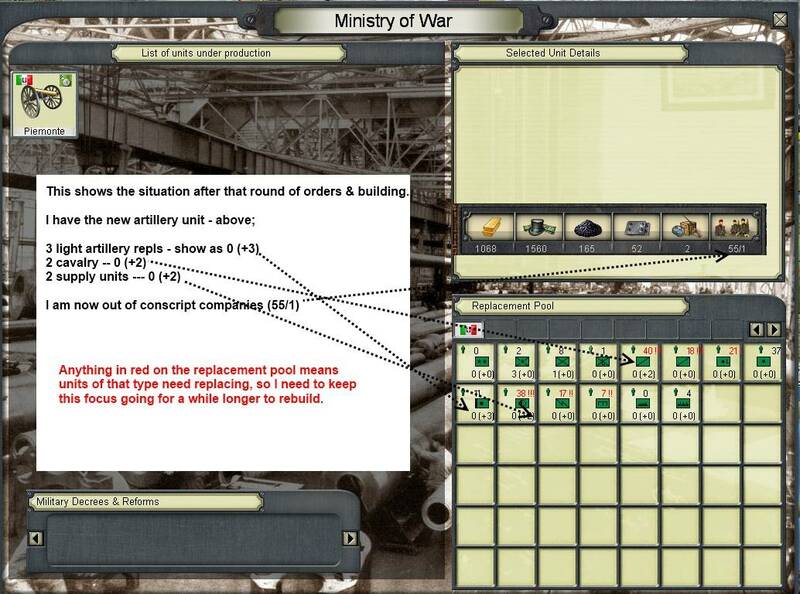 Now the army in this period, at different stages I build another field artillery unit, a balloon and a field hospital. 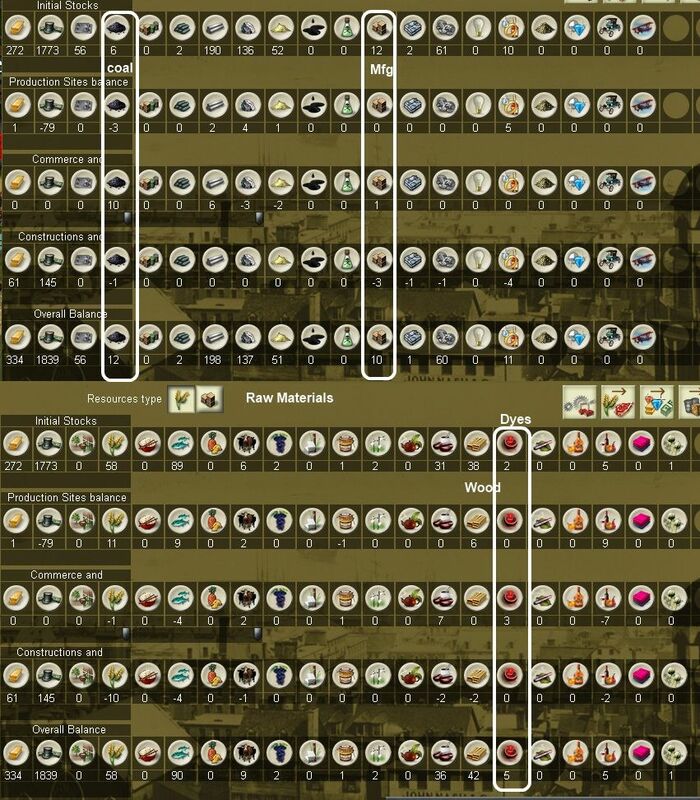 For the last two I've selected the detailed screen so you can see what they contribute. 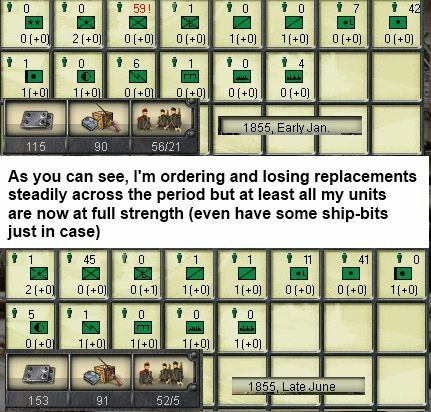 In 1856 I'll raise some signals units (these improve the Command Points of a stack). This shows the province borders. So, on the assumption that Parma et al are neutral, then the only initial border is between Milan and Alessandria. 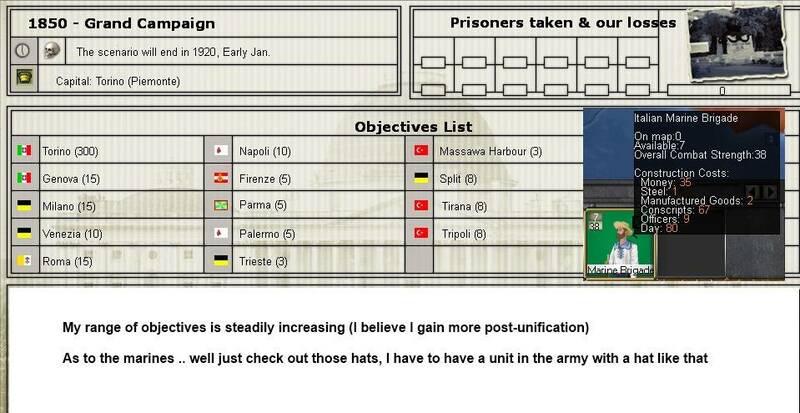 Depending on the deployment of the Austrians, I'd either start on the defense or attack Milan (at the moment they only have a few fortress units in N Italy). At the moment there is no rail line to Innsbruck or Trent, so I doubt a major counterattack could be carried out in that direction. Beyond that the war becomes a 2 province front. Note that a corps in Trentino (Trient) guards the flank not only of a siege of Venice but also any advance to Udine. (Venice is the only fort the Austrians) have. That informs my basic plan. 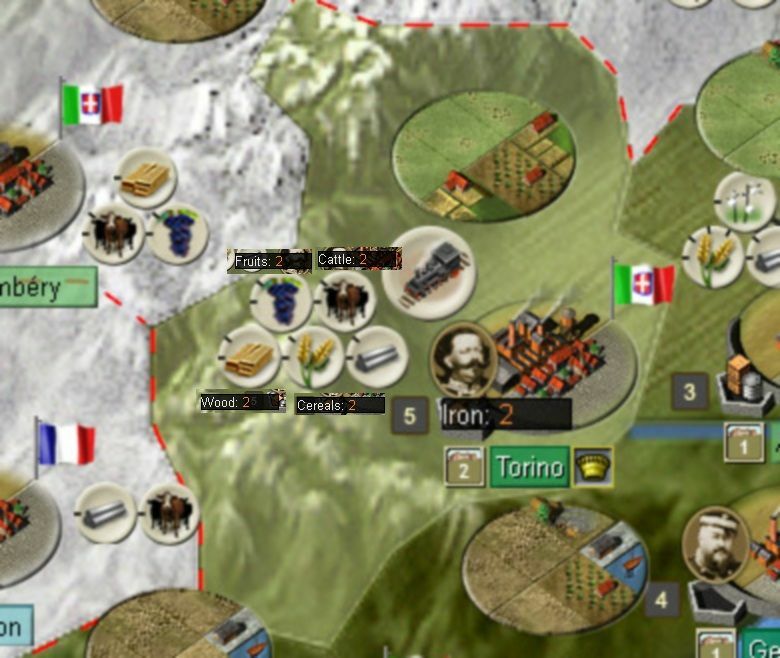 One corps to occupy Trient as a flank guard, the rest of the army to operate in the Po Valley. 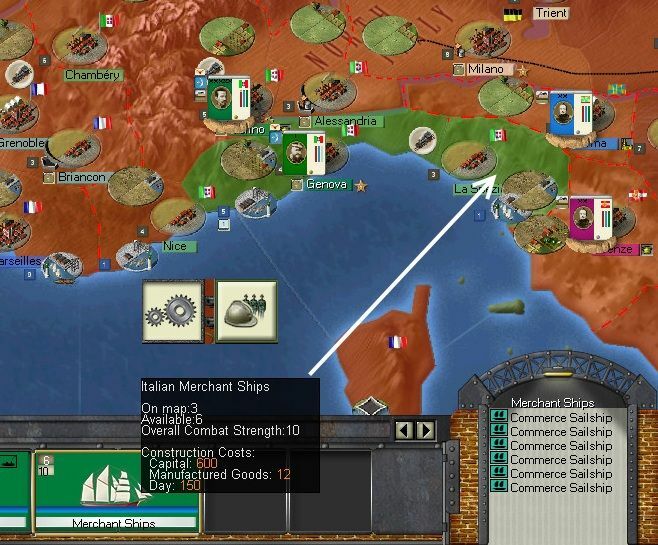 I'll also plan to use the marines for ampibious action in the Adriatic (I'm assuming my navy is stronger than the Austrians). 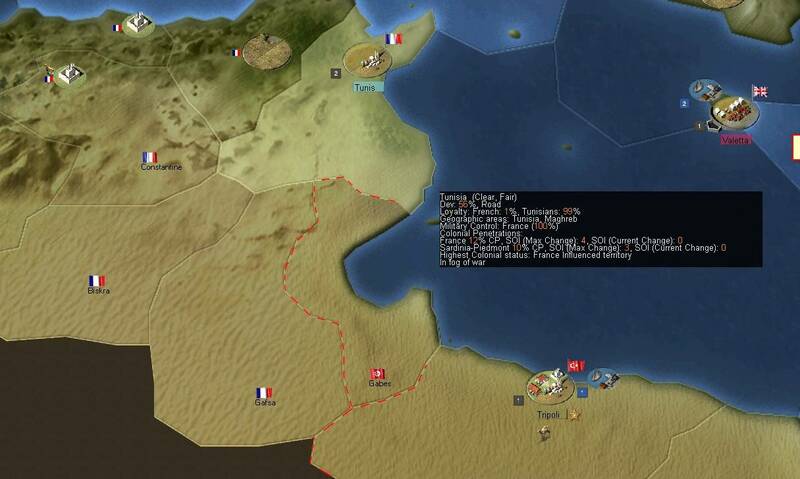 All this of course depends on French support and what the French AI will do in the GC. I've played the 1859 scenario and that remains very easy to crush the Austrians but in that you have direct control over the French forces committed to the war. But this side of Unification, I'm really not able to do much in this respect. 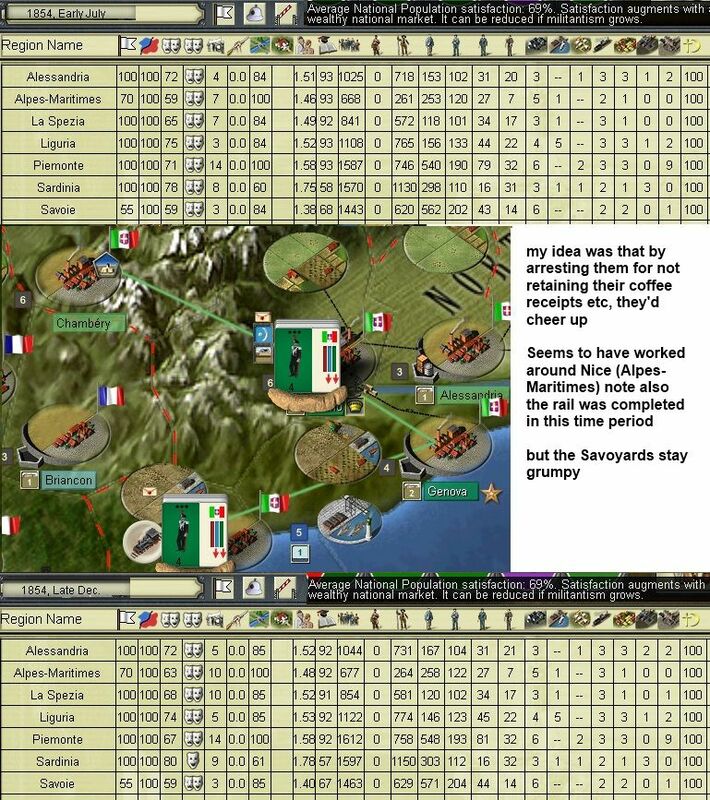 Thats another 24 turns processed ... 120 gone, 360 to my notional (1870 target), 1560 to the game end (1920).